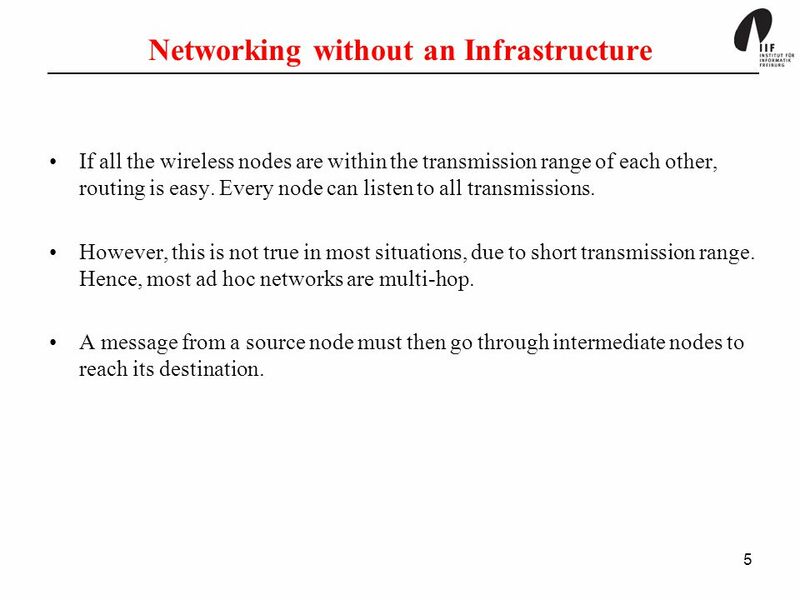 If all the wireless nodes are within the transmission range of each other, routing is easy. Every node can listen to all transmissions. However, this is not true in most situations, due to short transmission range. 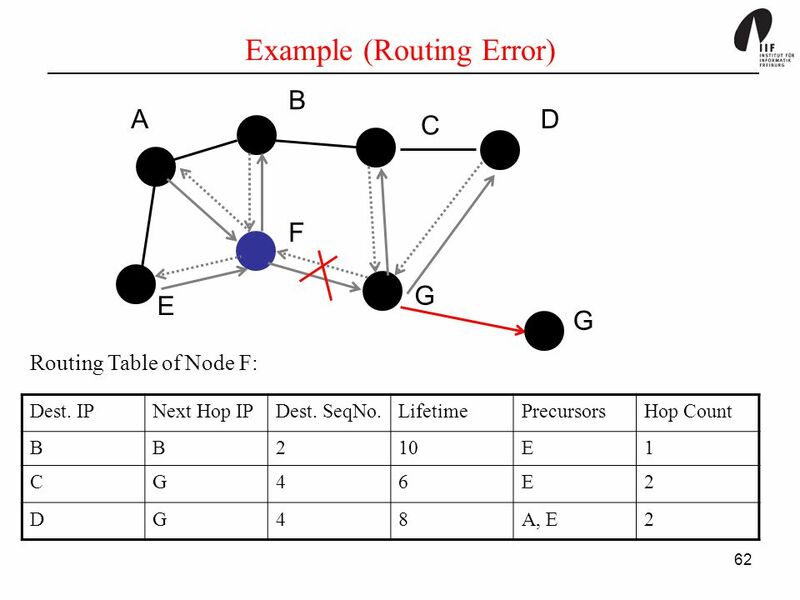 Hence, most ad hoc networks are multi-hop. 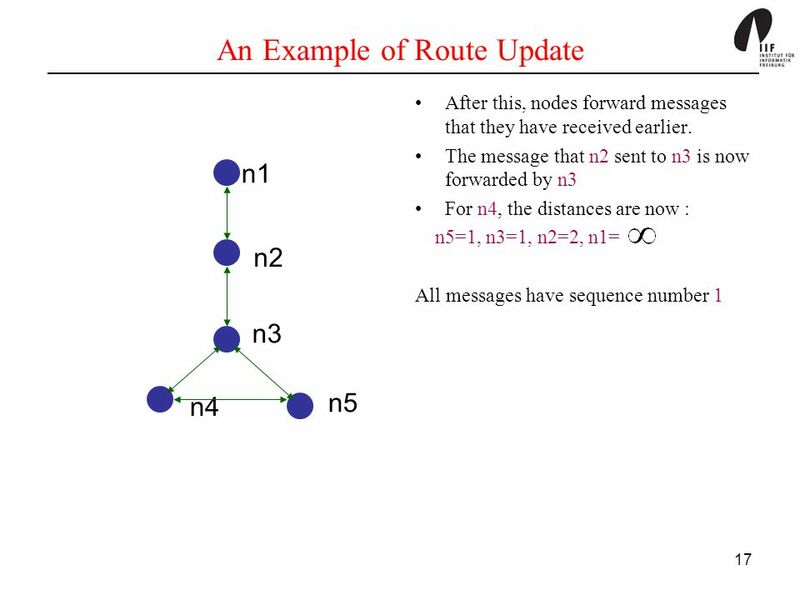 A message from a source node must then go through intermediate nodes to reach its destination. 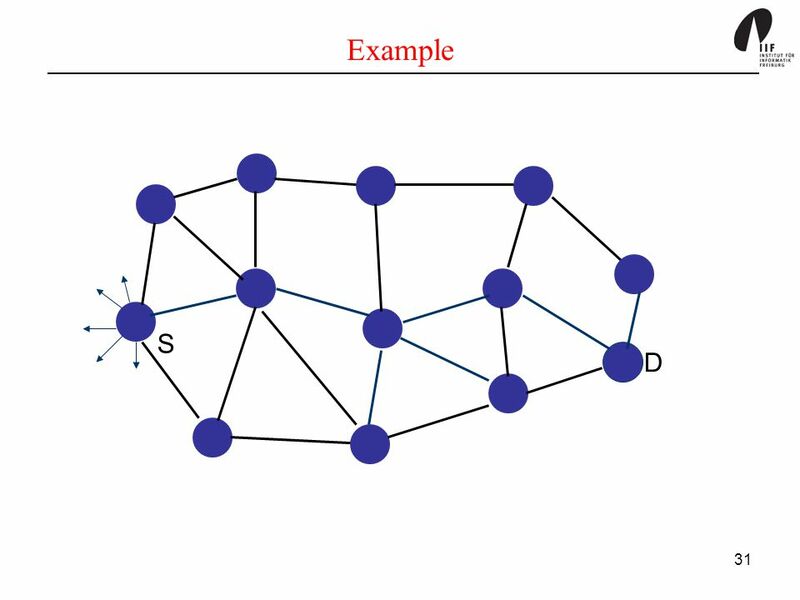 We will assume that each node is capable of running fairly complicated algorithms locally. Each node has an address and each node keeps track of the neighbours´ addresses. 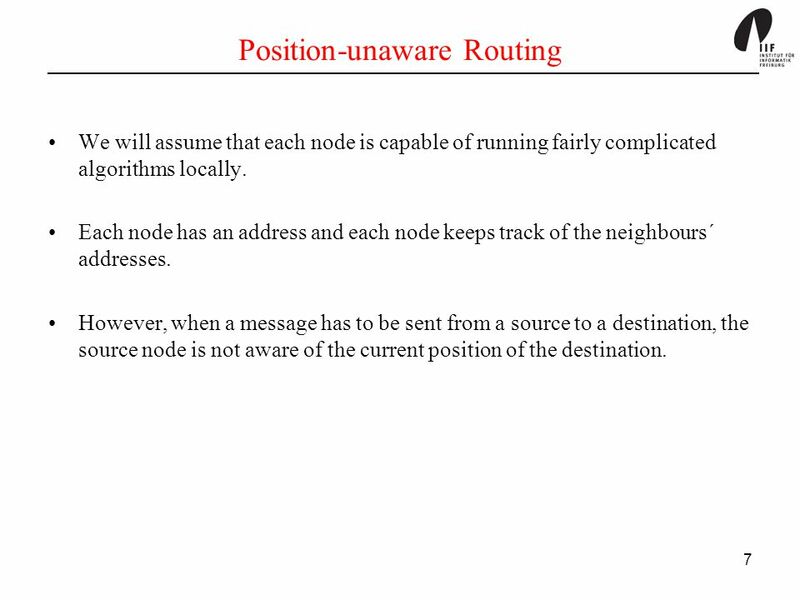 However, when a message has to be sent from a source to a destination, the source node is not aware of the current position of the destination. 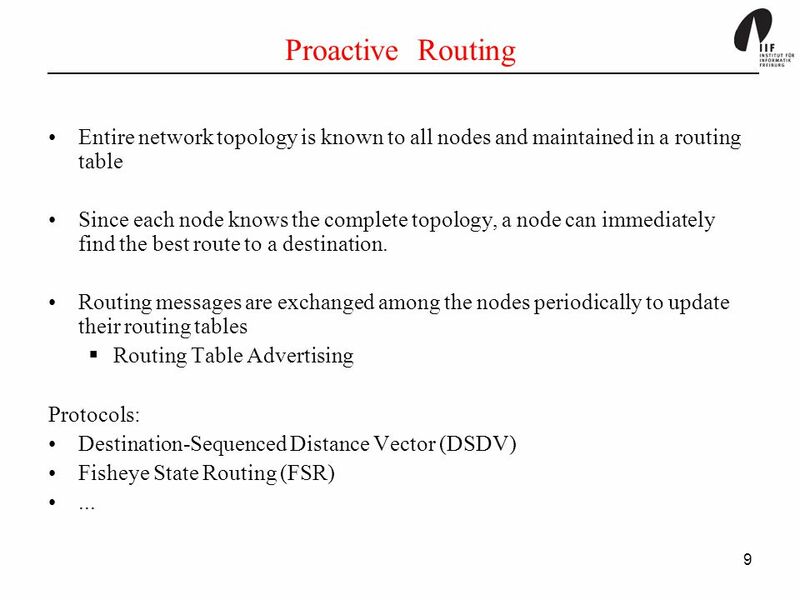 Packets are transmitted between the nodes using route tables stored at each node. Each route table lists all available destinations and the number of hops to each destination. 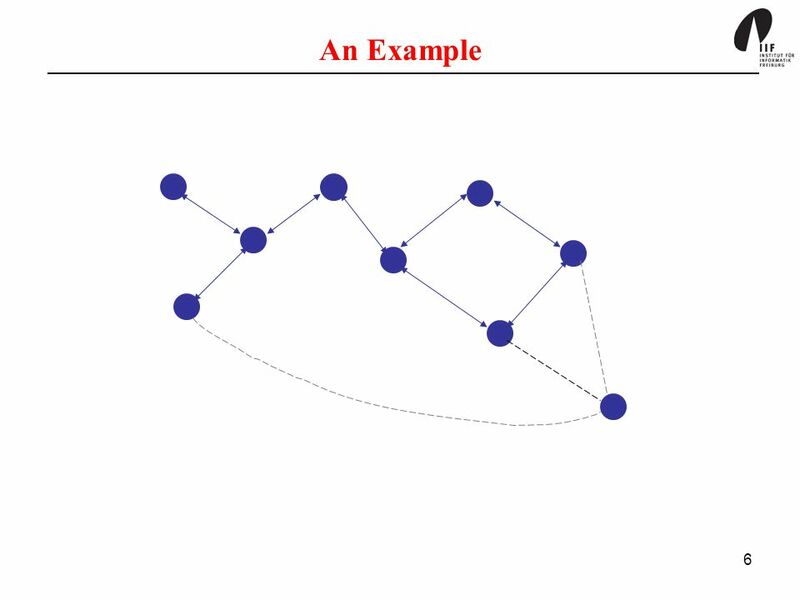 For each destination, a node knows which of its neighbours leads to the shortest path to the destination. 13 k l x i 8 m 23 Consider a node i. 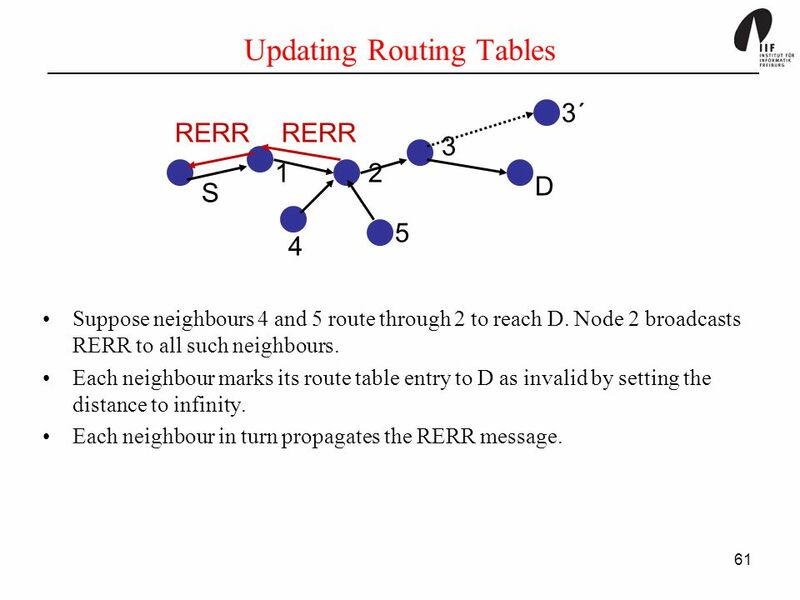 Suppose, i needs to send a message to node x. i can look up the best route to x from its routing table and forwards the message to the neighbour along the best route. The neighbour in turn checks the best route from its own table and forwards the message to its appropriate neighbour. The routing progresses this way. 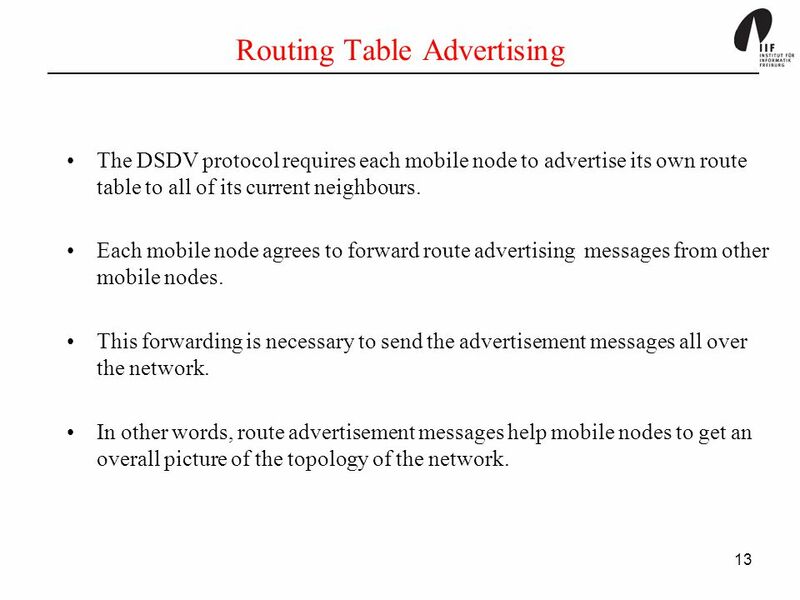 The DSDV protocol requires each mobile node to advertise its own route table to all of its current neighbours. 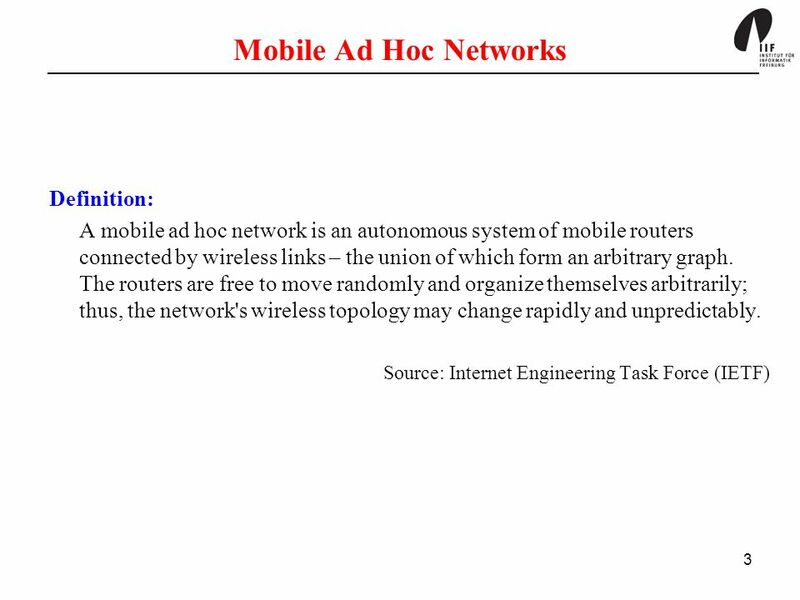 Each mobile node agrees to forward route advertising messages from other mobile nodes. This forwarding is necessary to send the advertisement messages all over the network. 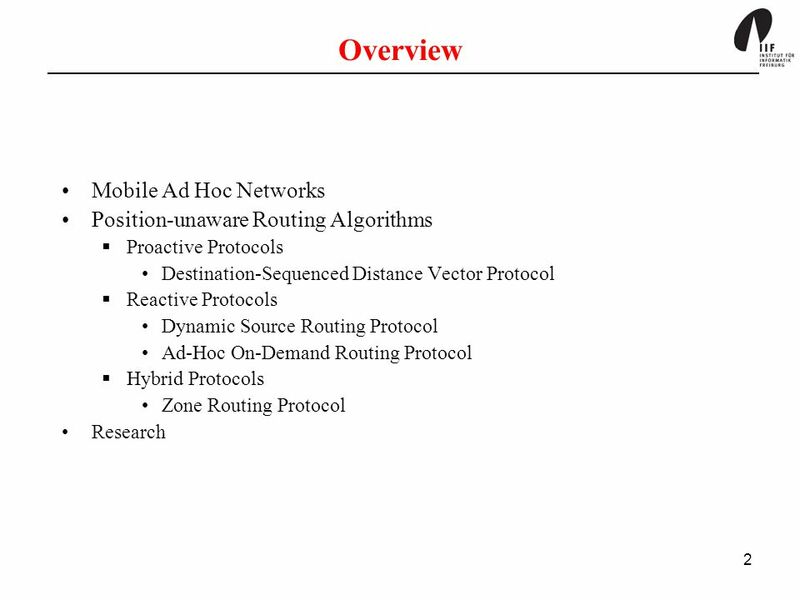 In other words, route advertisement messages help mobile nodes to get an overall picture of the topology of the network. It is necessary to avoid excessive control traffic (route update information). Otherwise, the bandwidth will be taken up by control traffic. 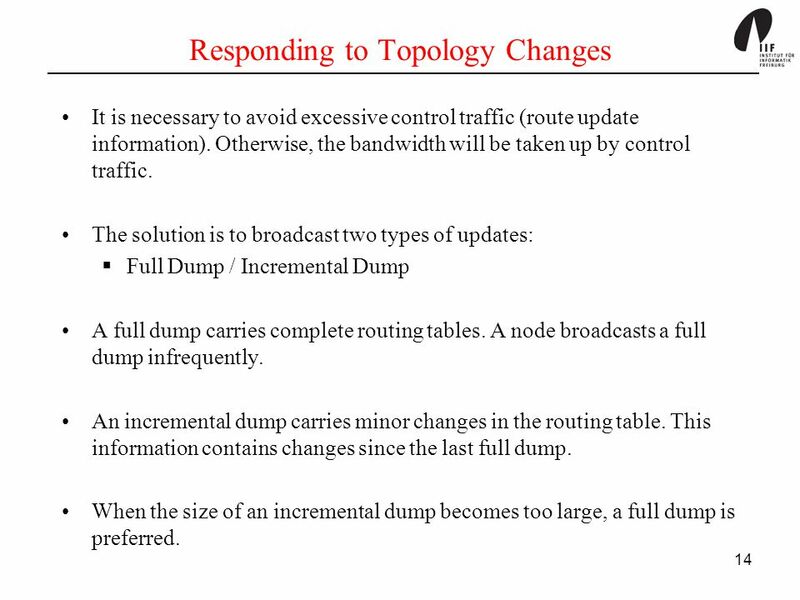 The solution is to broadcast two types of updates: Full Dump / Incremental Dump A full dump carries complete routing tables. A node broadcasts a full dump infrequently. 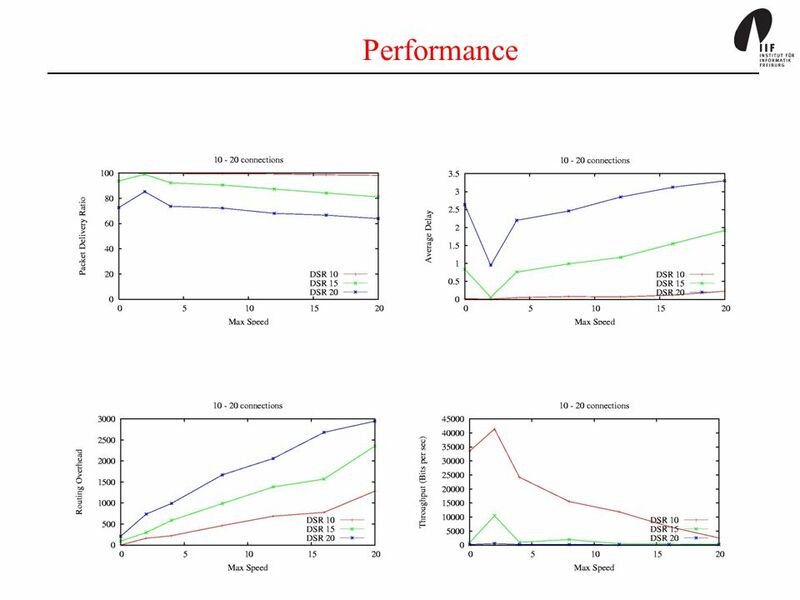 An incremental dump carries minor changes in the routing table. This information contains changes since the last full dump. When the size of an incremental dump becomes too large, a full dump is preferred. 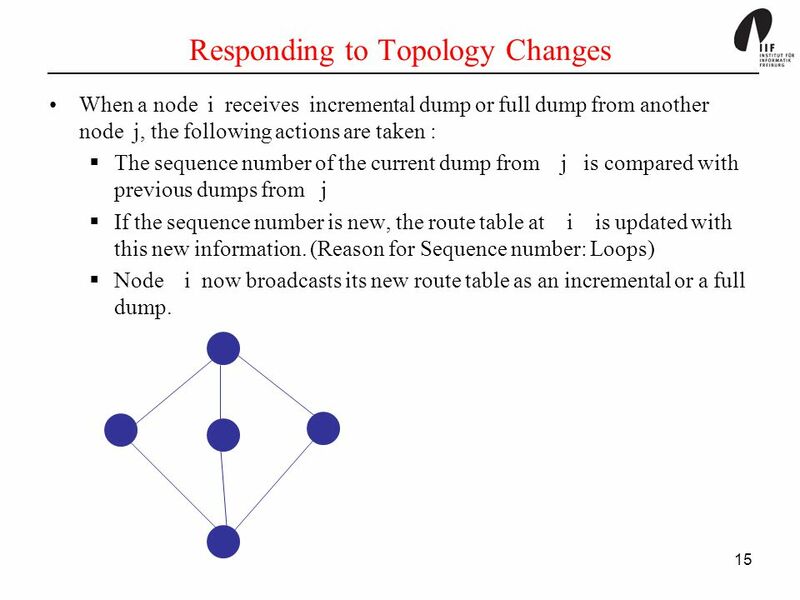 When a node i receives incremental dump or full dump from another node j, the following actions are taken : The sequence number of the current dump from j is compared with previous dumps from j If the sequence number is new, the route table at i is updated with this new information. 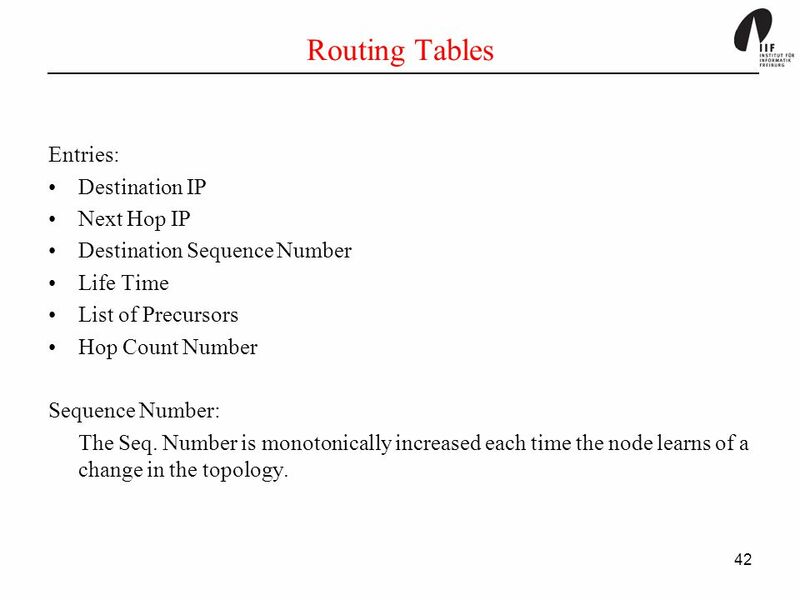 (Reason for Sequence number: Loops) Node i now broadcasts its new route table as an incremental or a full dump. 20 How good is DSDV? 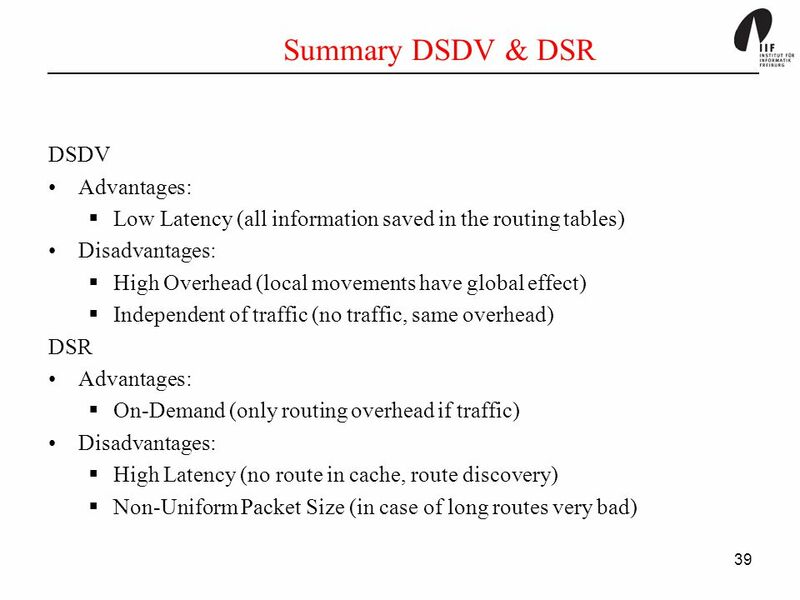 DSDV is an efficient protocol for route discovery. Whenever a route to a new destination is required, it already exists at the source. 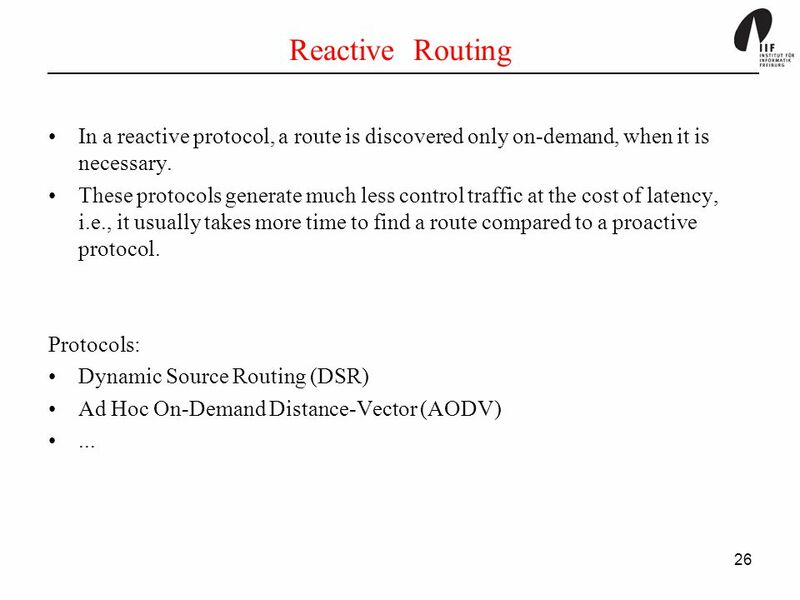 Hence, latency for route discovery is very low. 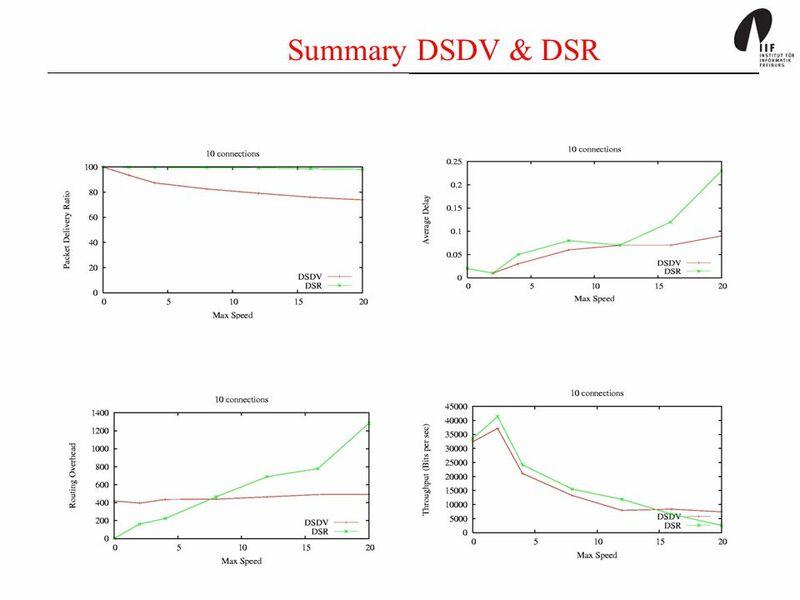 However, DSDV needs to send a lot of control messages. 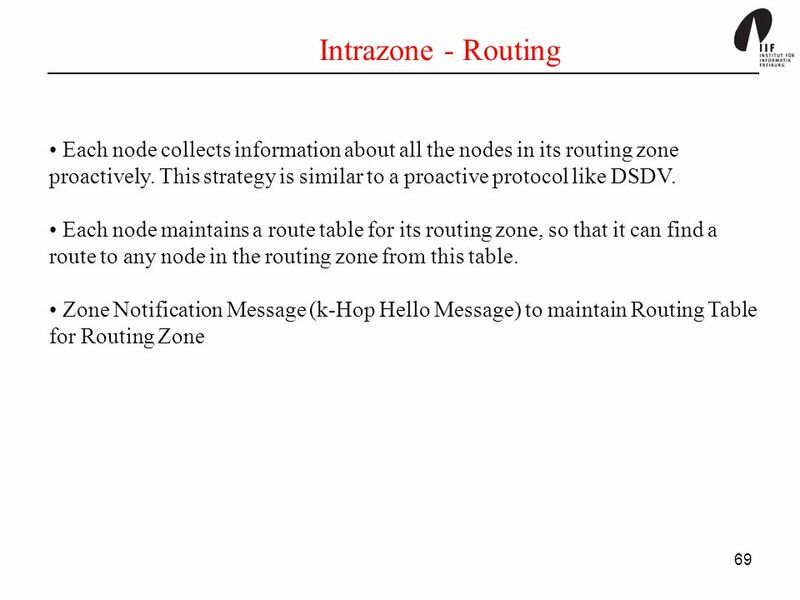 These messages are important for maintaining the network topology at each node. This may generate high volume of traffic for high-density and highly mobile networks. 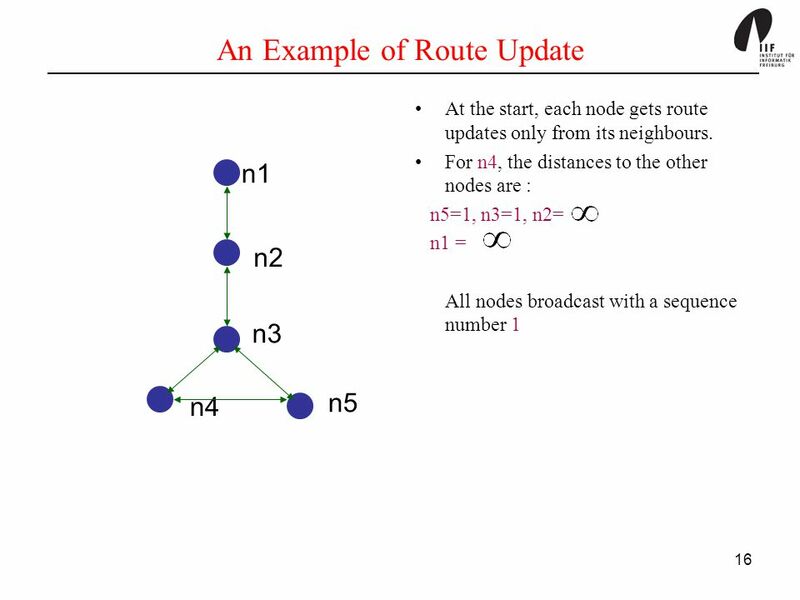 Each node maintains a route cache to remember routes that it has learnt about. 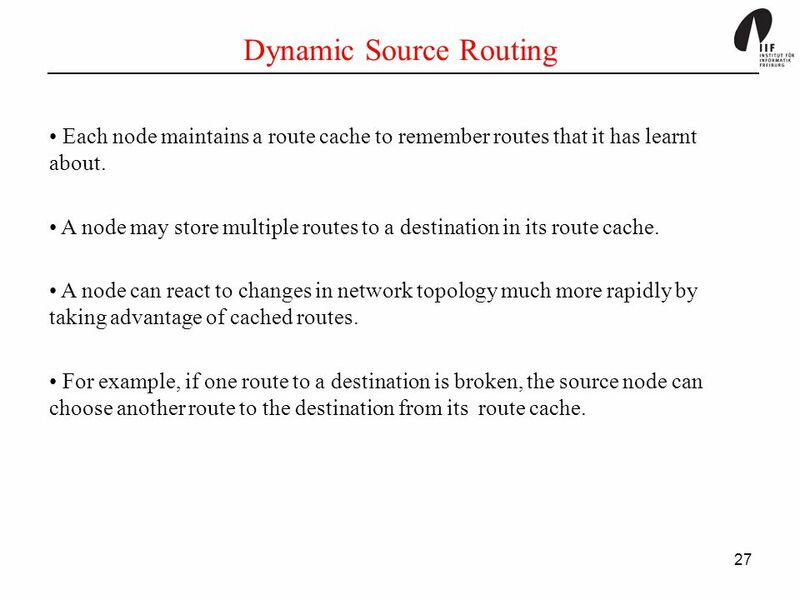 A node may store multiple routes to a destination in its route cache. 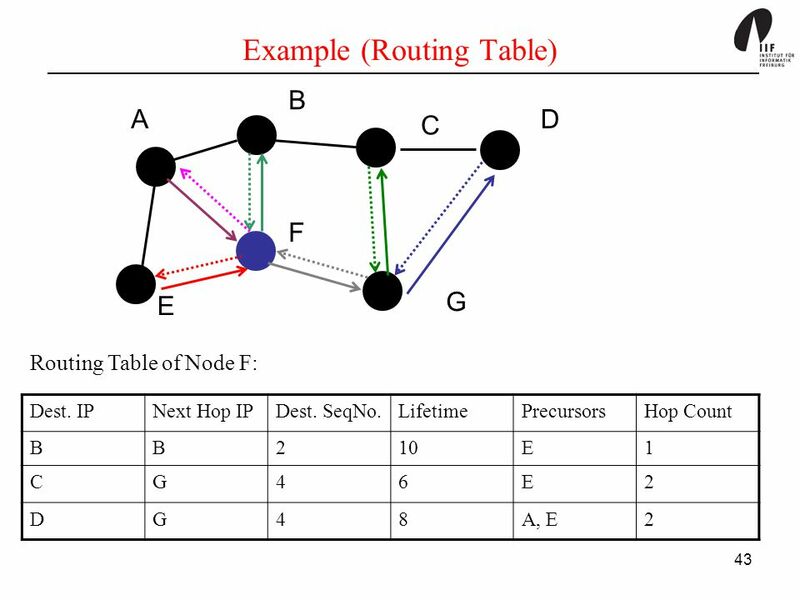 A node can react to changes in network topology much more rapidly by taking advantage of cached routes. 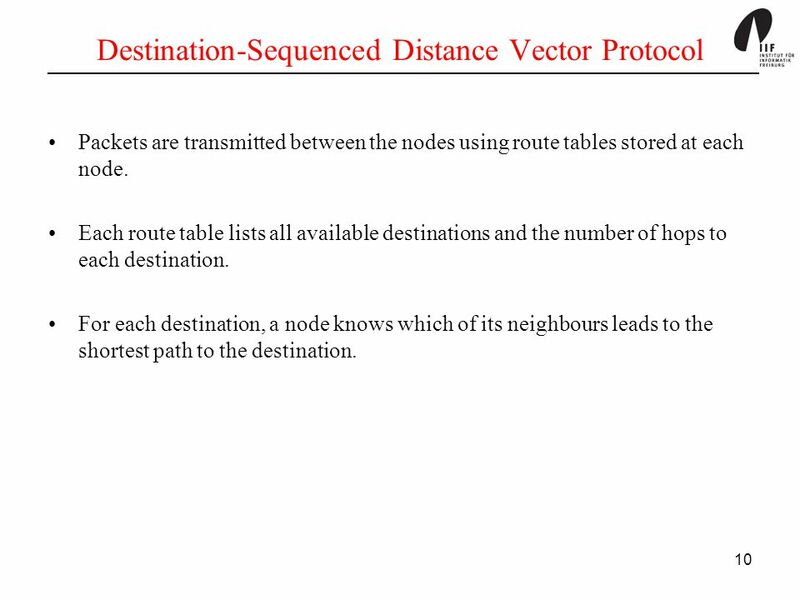 For example, if one route to a destination is broken, the source node can choose another route to the destination from its route cache. 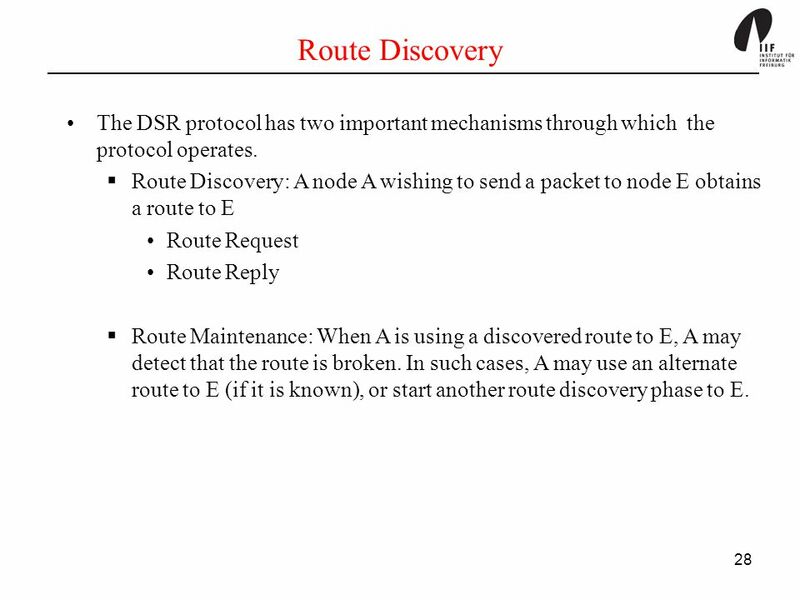 28 Route Discovery The DSR protocol has two important mechanisms through which the protocol operates. 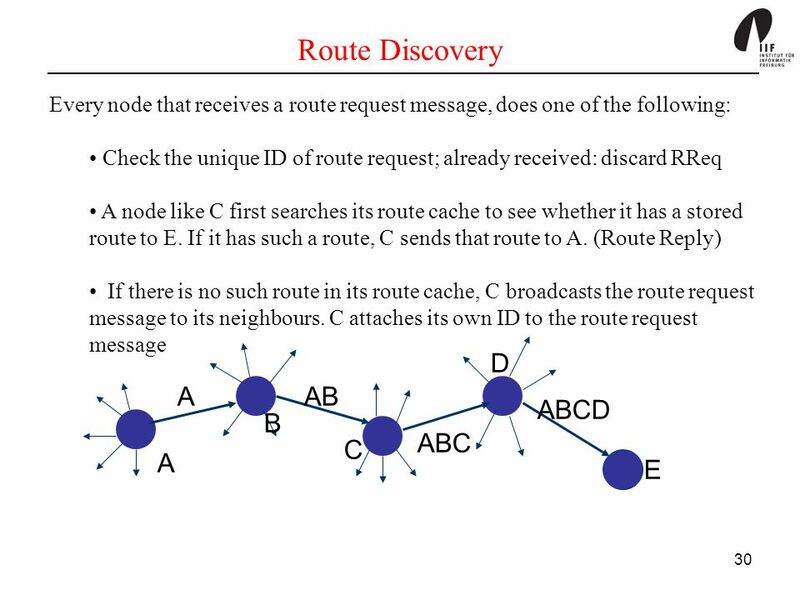 Route Discovery: A node A wishing to send a packet to node E obtains a route to E Route Request Route Reply Route Maintenance: When A is using a discovered route to E, A may detect that the route is broken. 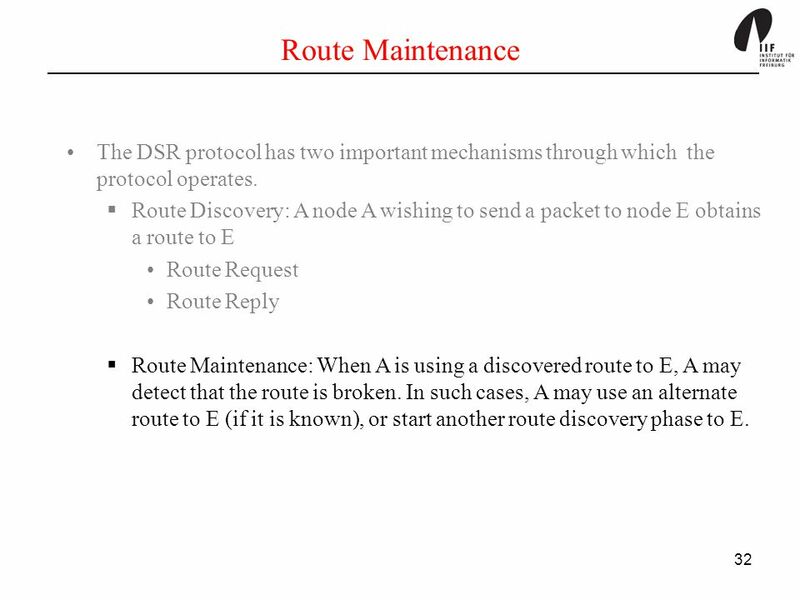 In such cases, A may use an alternate route to E (if it is known), or start another route discovery phase to E.
32 Route Maintenance The DSR protocol has two important mechanisms through which the protocol operates. 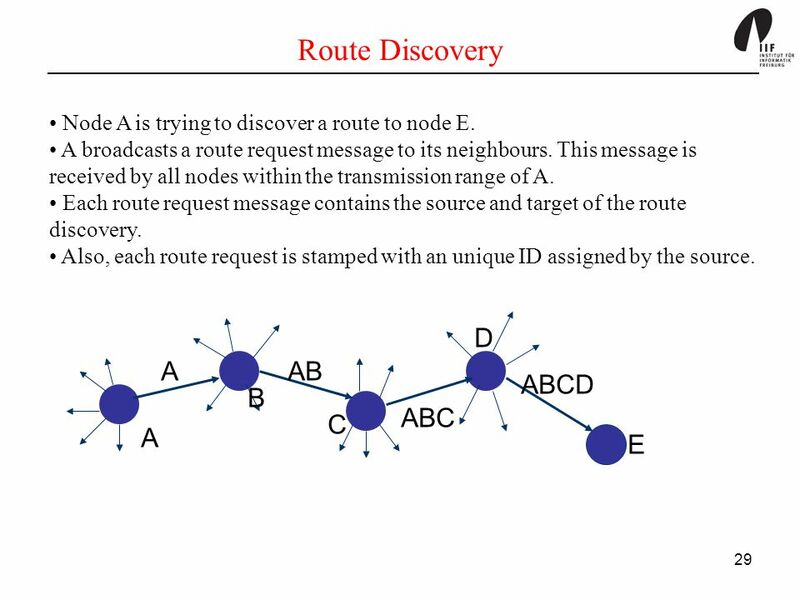 Route Discovery: A node A wishing to send a packet to node E obtains a route to E Route Request Route Reply Route Maintenance: When A is using a discovered route to E, A may detect that the route is broken. 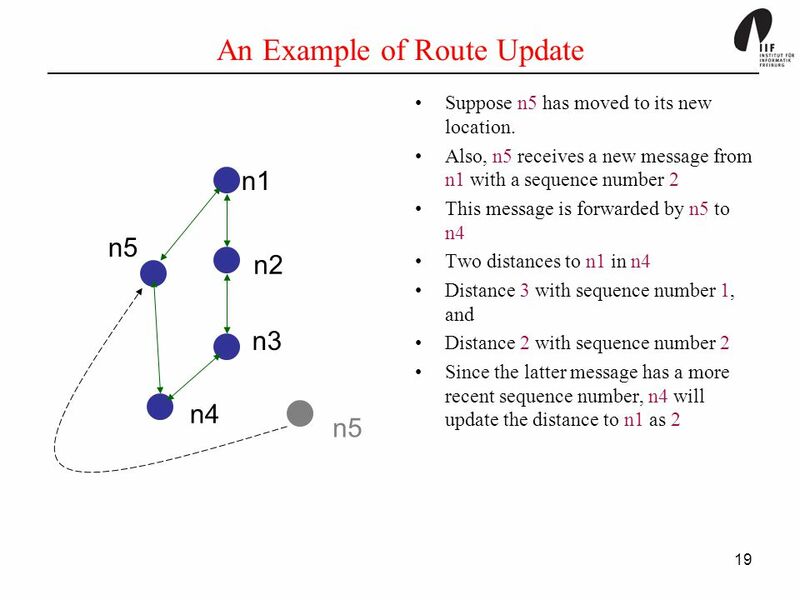 In such cases, A may use an alternate route to E (if it is known), or start another route discovery phase to E.
33 Route Error A B C D E A node like C tries to forward the message and waits for acknowledgment. C will retransmit the message a fixed number of times if no acknowledgment arrives. After that, C will initiate a route error message. 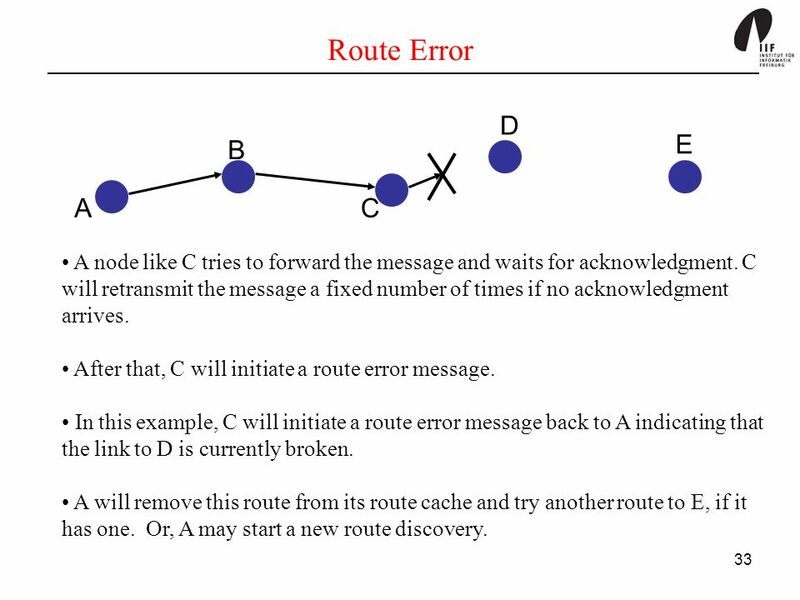 In this example, C will initiate a route error message back to A indicating that the link to D is currently broken. 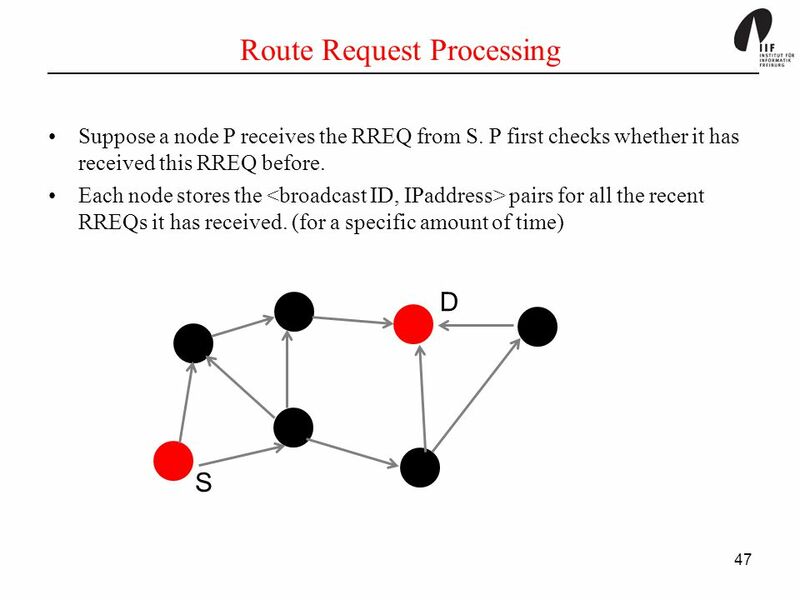 A will remove this route from its route cache and try another route to E, if it has one. Or, A may start a new route discovery. 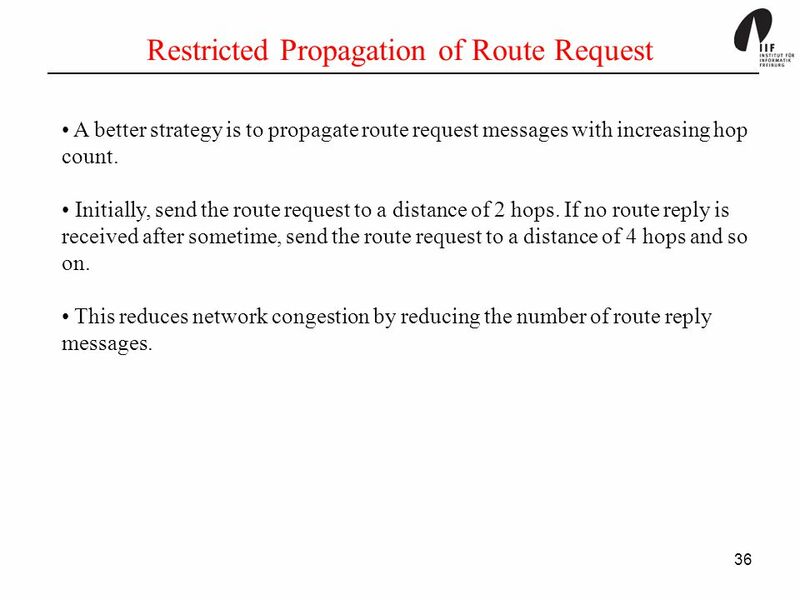 A better strategy is to propagate route request messages with increasing hop count. 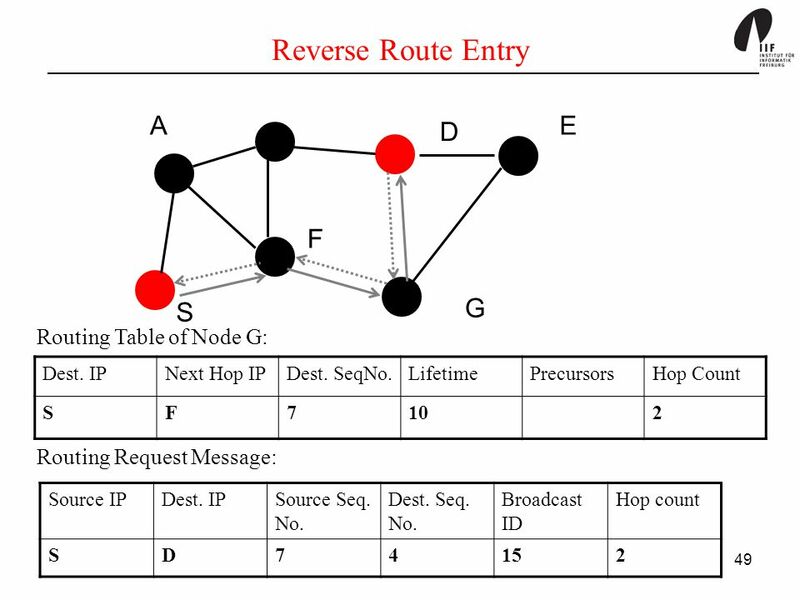 Initially, send the route request to a distance of 2 hops. 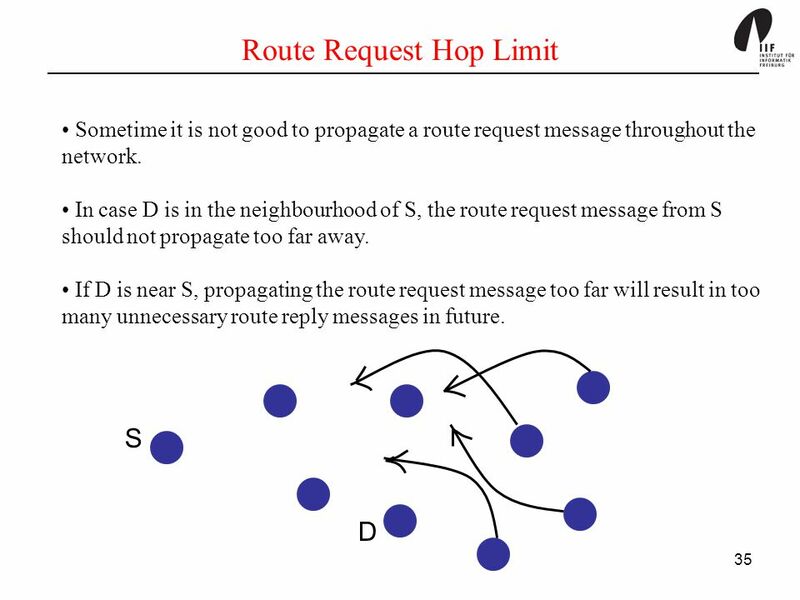 If no route reply is received after sometime, send the route request to a distance of 4 hops and so on. 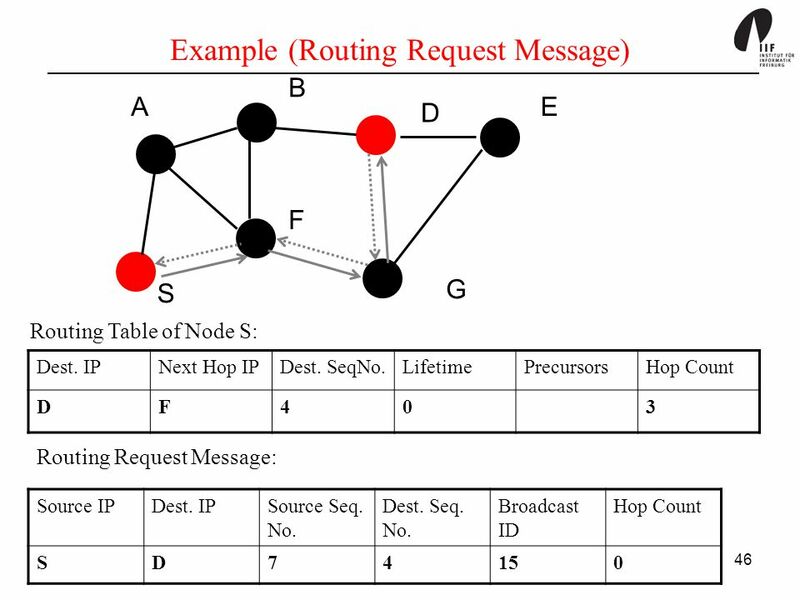 This reduces network congestion by reducing the number of route reply messages. 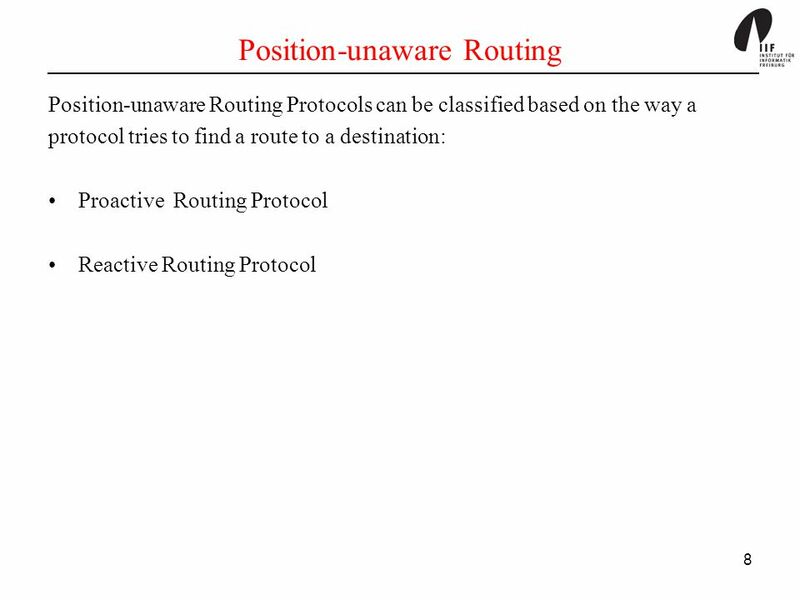 When a source node A sends a packet to a destination node E, A should send the entire route to E along with the packet. 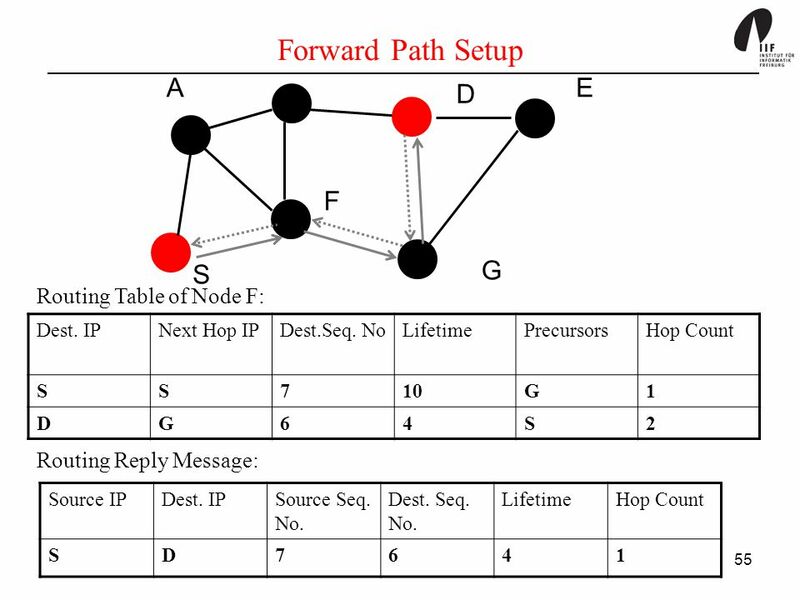 This is necessary for the intermediate nodes to forward the packet. Usually all media support packets of uniform size. If a packet is large, it has to be split into smaller packets. 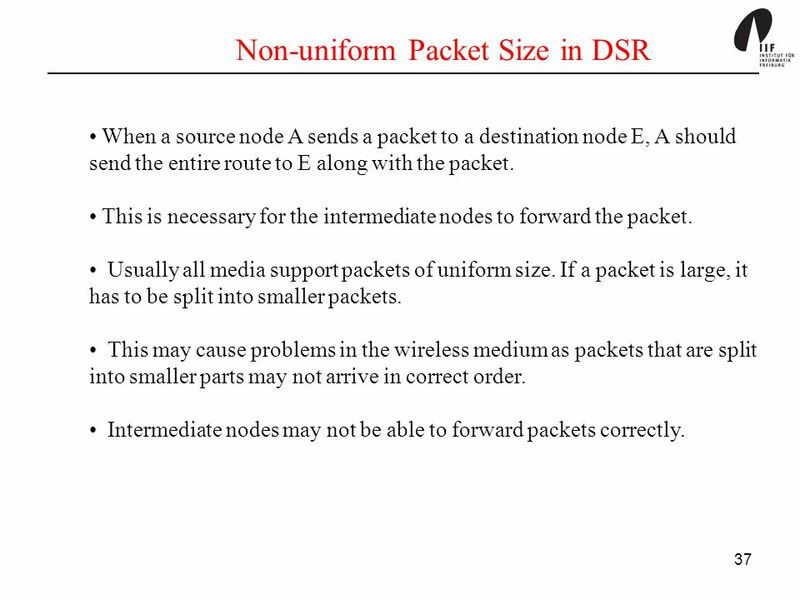 This may cause problems in the wireless medium as packets that are split into smaller parts may not arrive in correct order. 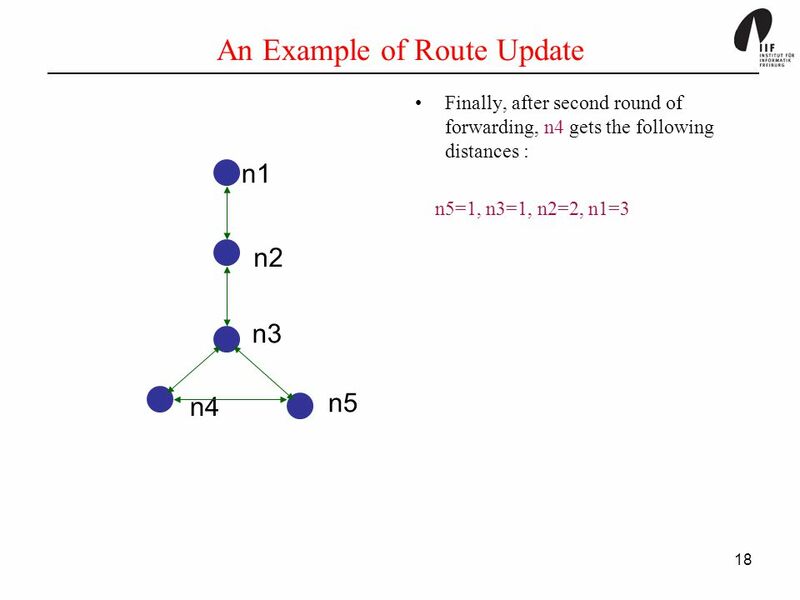 Intermediate nodes may not be able to forward packets correctly. 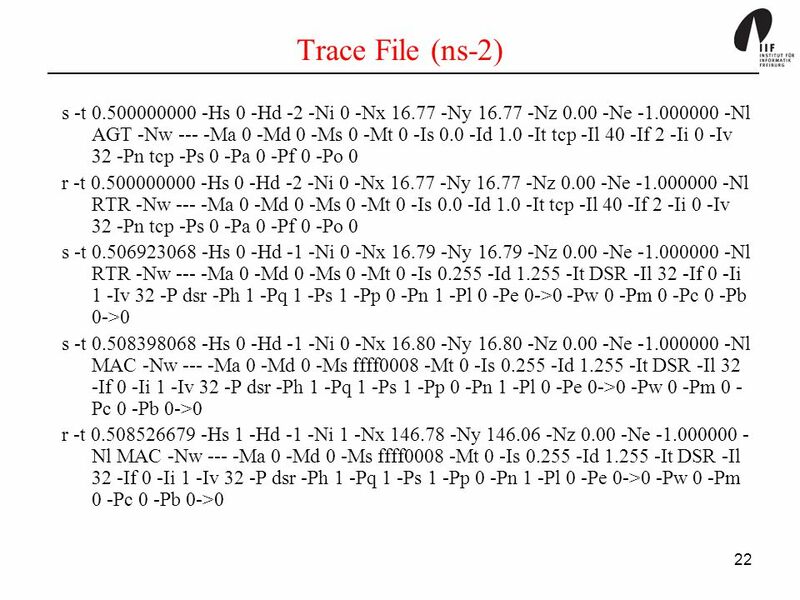 Destination Sequence Number Life Time List of Precursors Hop Count Number Sequence Number: The Seq. Number is monotonically increased each time the node learns of a change in the topology. 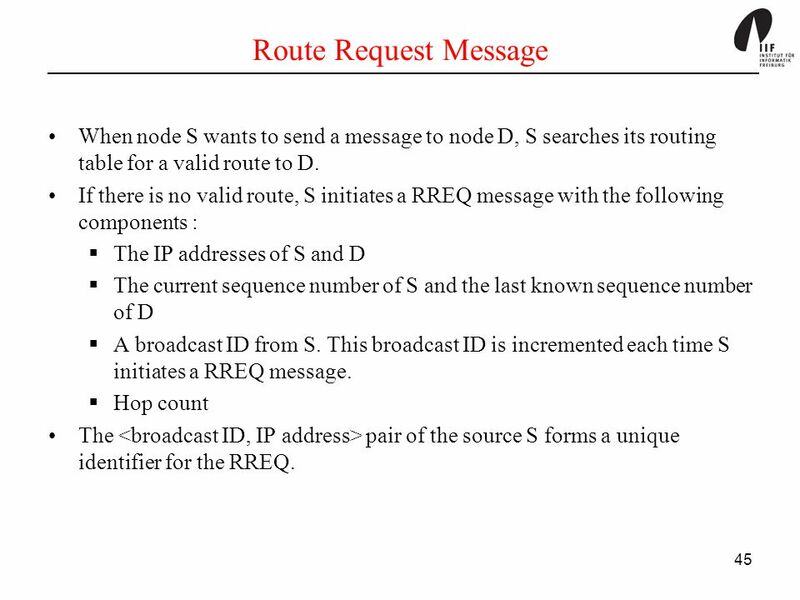 45 Route Request Message When node S wants to send a message to node D, S searches its routing table for a valid route to D. If there is no valid route, S initiates a RREQ message with the following components : The IP addresses of S and D The current sequence number of S and the last known sequence number of D A broadcast ID from S. This broadcast ID is incremented each time S initiates a RREQ message. Hop count The <broadcast ID, IP address> pair of the source S forms a unique identifier for the RREQ. D P Q If P has seen this RREQ from S already, P discards the RREQ. 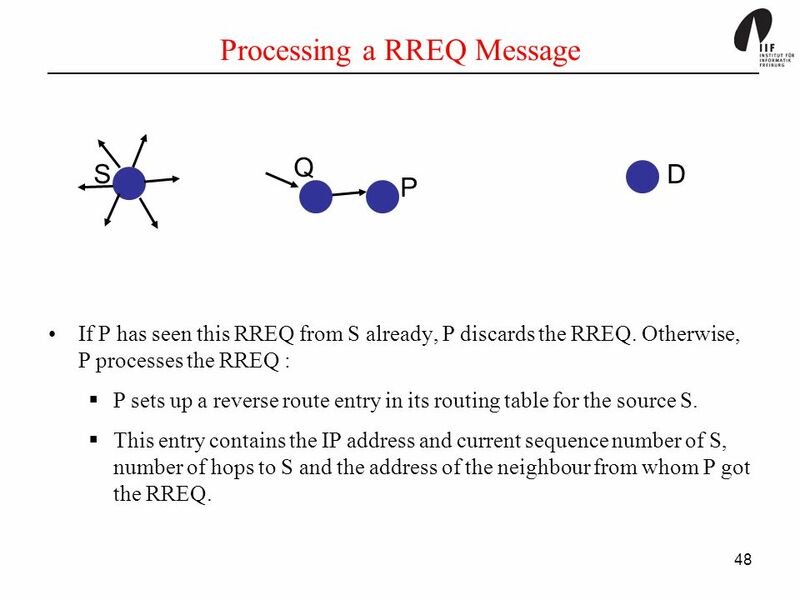 Otherwise, P processes the RREQ : P sets up a reverse route entry in its routing table for the source S. This entry contains the IP address and current sequence number of S, number of hops to S and the address of the neighbour from whom P got the RREQ. 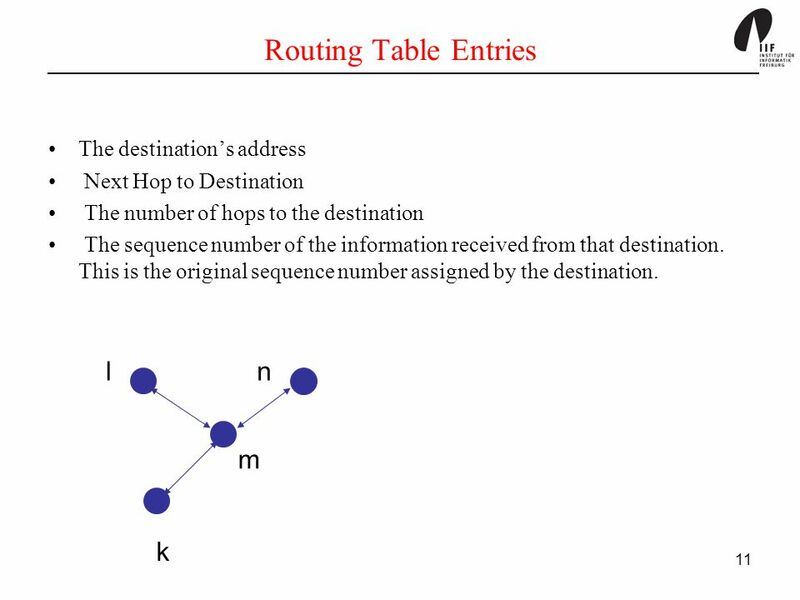 P can respond to the RREQ from S if P has an unexpired entry for D in its routing table. Moreover, the sequence number from D that P has, must not be less than the sequence number of D that was in the RREQ from S. This ensures that there is no loop in the route. If P satisfies both of these requirements, it sends a RREP message back to S. If P cannot reply to the RREQ from S, P increments the hop-count of the RREQ and broadcasts it to its neighbours. 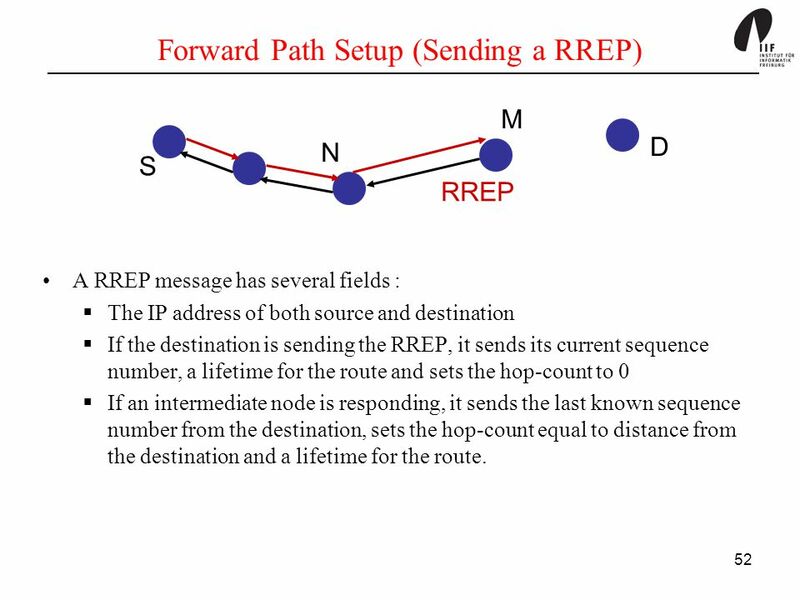 M N A RREP message has several fields : The IP address of both source and destination If the destination is sending the RREP, it sends its current sequence number, a lifetime for the route and sets the hop-count to 0 If an intermediate node is responding, it sends the last known sequence number from the destination, sets the hop-count equal to distance from the destination and a lifetime for the route. 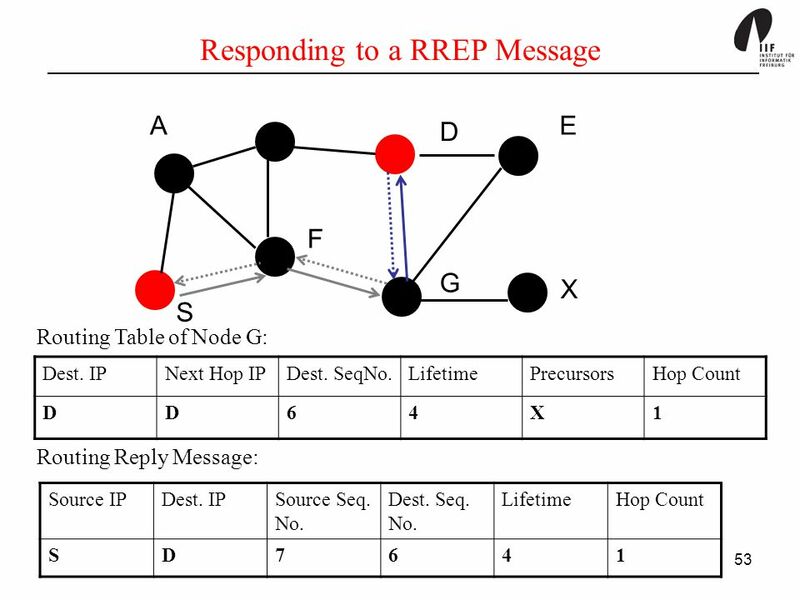 A node (here Node M) sends a RREP back to a neighbour from whom it received the RREQ. 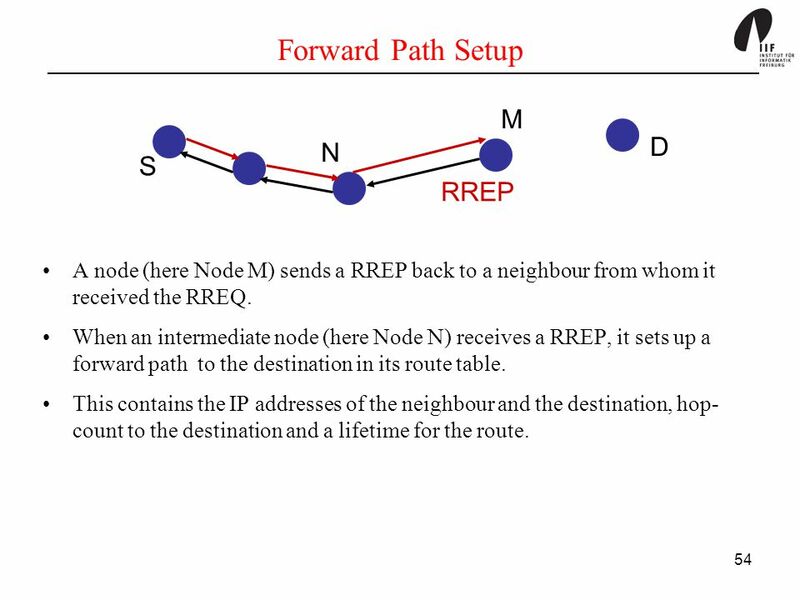 When an intermediate node (here Node N) receives a RREP, it sets up a forward path to the destination in its route table. This contains the IP addresses of the neighbour and the destination, hop-count to the destination and a lifetime for the route. S D M P An intermediate node P may receive more than one RREP for the same RREQ. 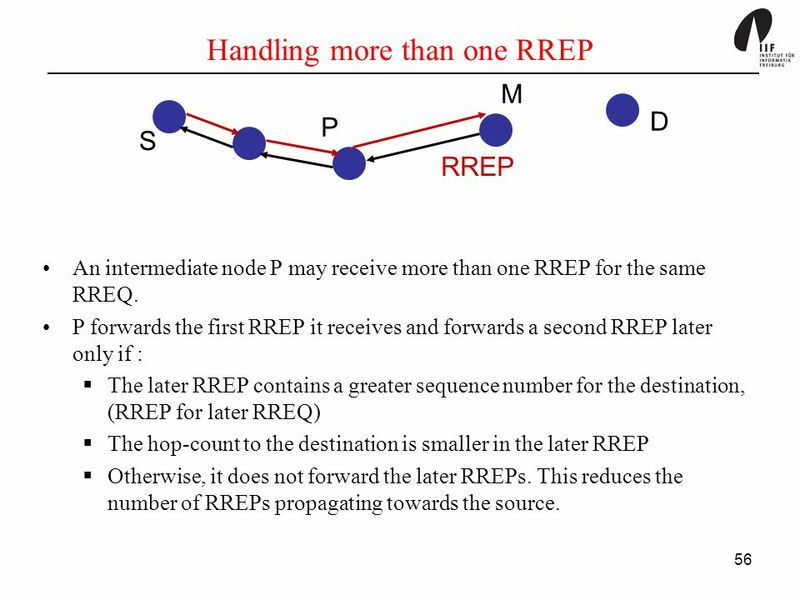 P forwards the first RREP it receives and forwards a second RREP later only if : The later RREP contains a greater sequence number for the destination, (RREP for later RREQ) The hop-count to the destination is smaller in the later RREP Otherwise, it does not forward the later RREPs. This reduces the number of RREPs propagating towards the source. 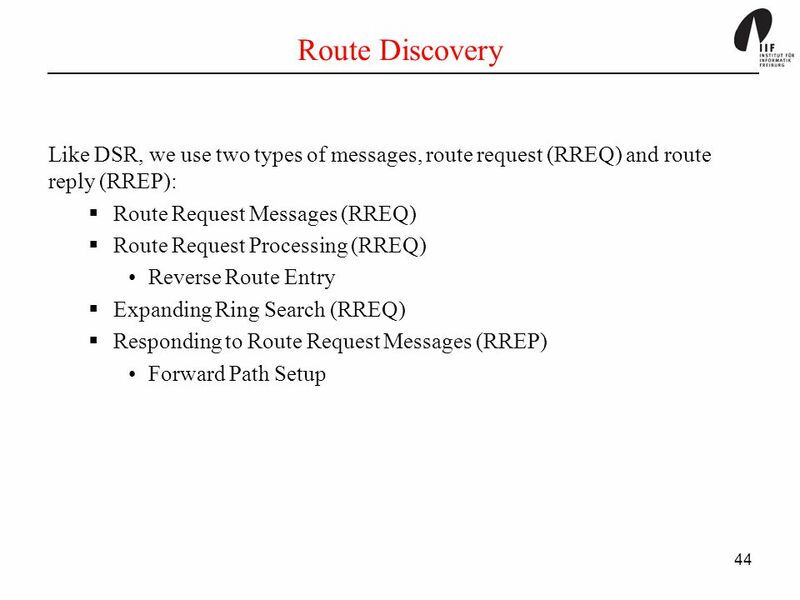 57 Expanding Ring Search For route discovery, a source node broadcasts a RREQ across the network. This may create a lot of messages in a large network. 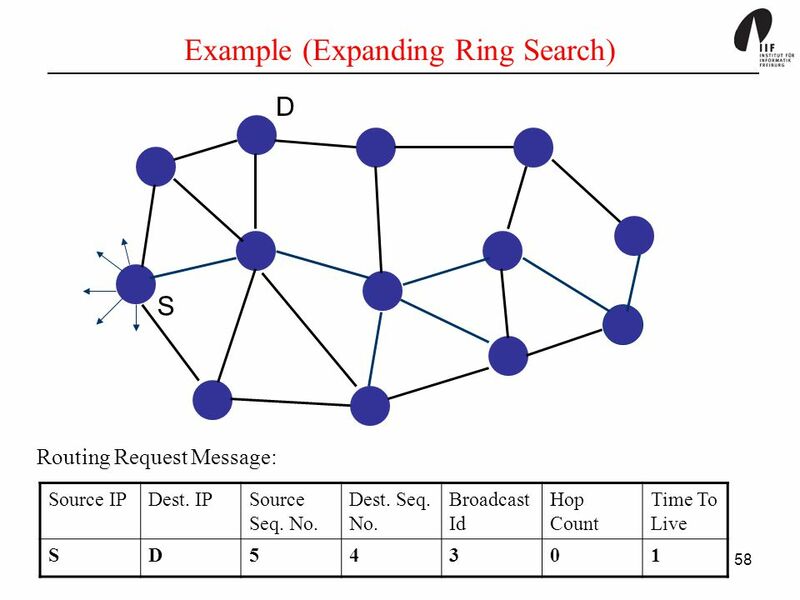 A source node uses an expanding ring search strategy. 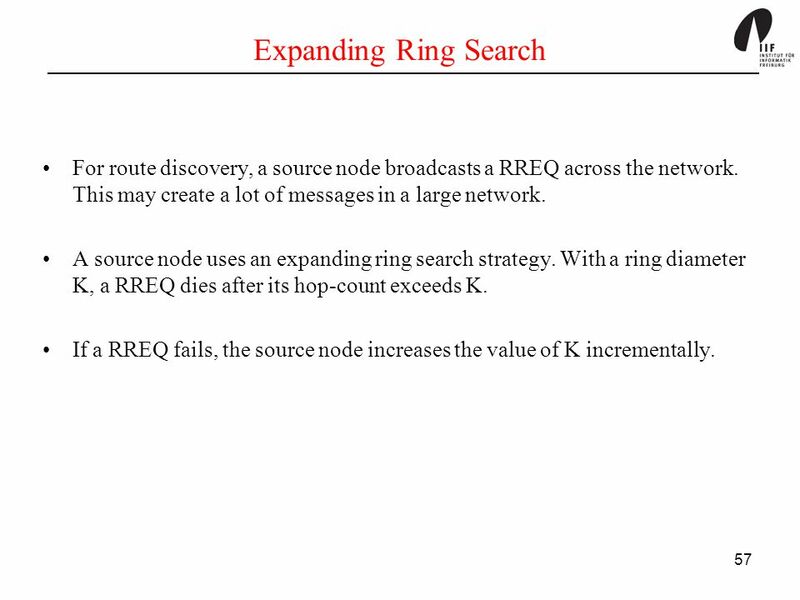 With a ring diameter K, a RREQ dies after its hop-count exceeds K. If a RREQ fails, the source node increases the value of K incrementally. 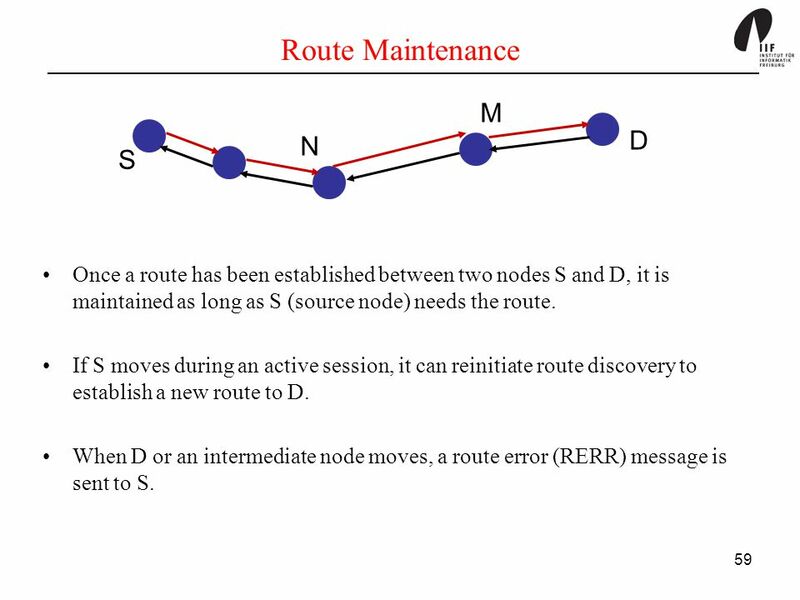 Once a route has been established between two nodes S and D, it is maintained as long as S (source node) needs the route. 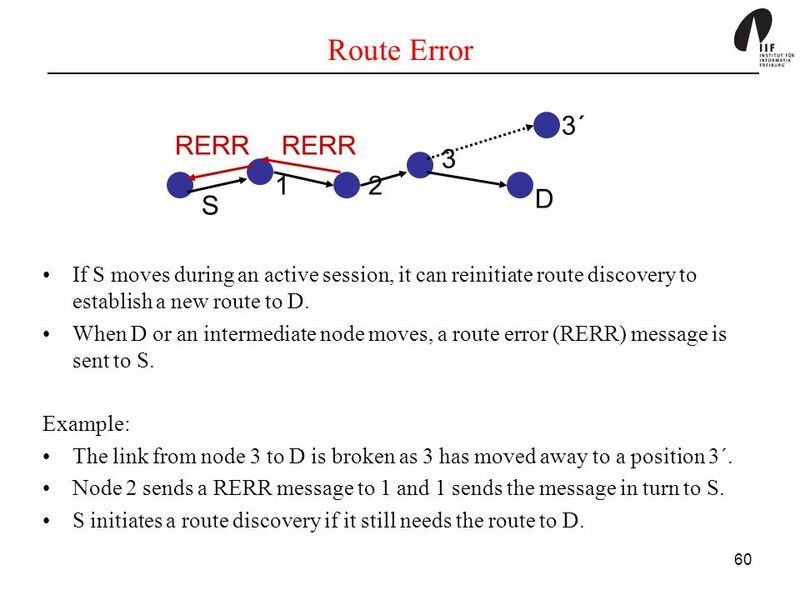 If S moves during an active session, it can reinitiate route discovery to establish a new route to D. When D or an intermediate node moves, a route error (RERR) message is sent to S.
60 Route Error 1 2 3 S D RERR 3´ If S moves during an active session, it can reinitiate route discovery to establish a new route to D. When D or an intermediate node moves, a route error (RERR) message is sent to S. Example: The link from node 3 to D is broken as 3 has moved away to a position 3´. Node 2 sends a RERR message to 1 and 1 sends the message in turn to S. S initiates a route discovery if it still needs the route to D.
1 2 3 S D RERR 3´ 4 5 Suppose neighbours 4 and 5 route through 2 to reach D. Node 2 broadcasts RERR to all such neighbours. 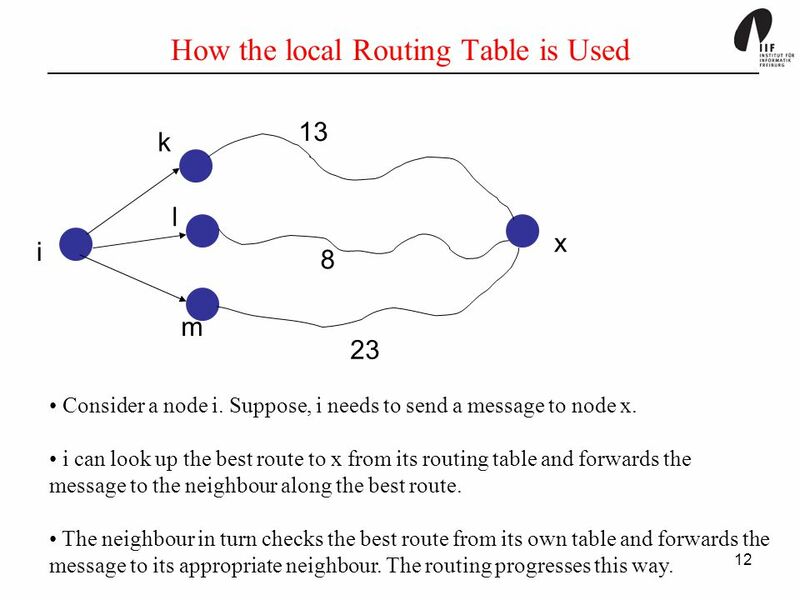 Each neighbour marks its route table entry to D as invalid by setting the distance to infinity. Each neighbour in turn propagates the RERR message. 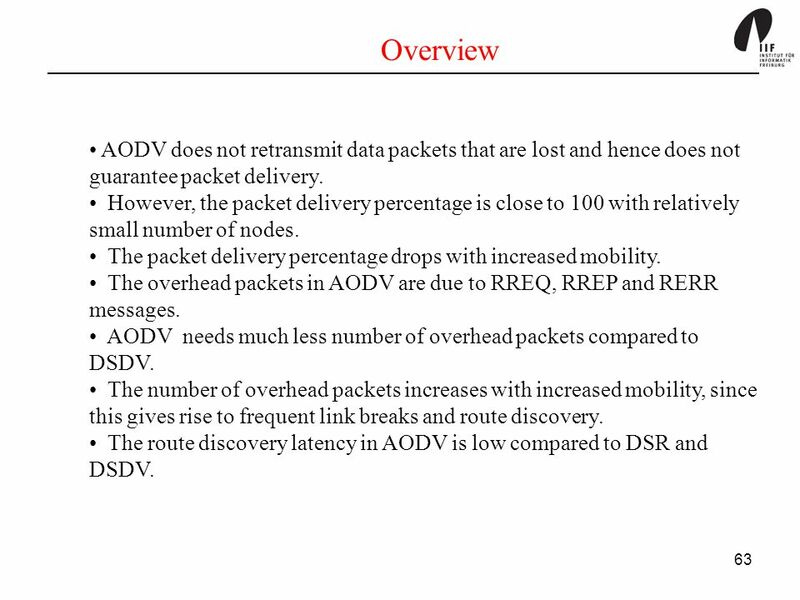 63 Overview AODV does not retransmit data packets that are lost and hence does not guarantee packet delivery. 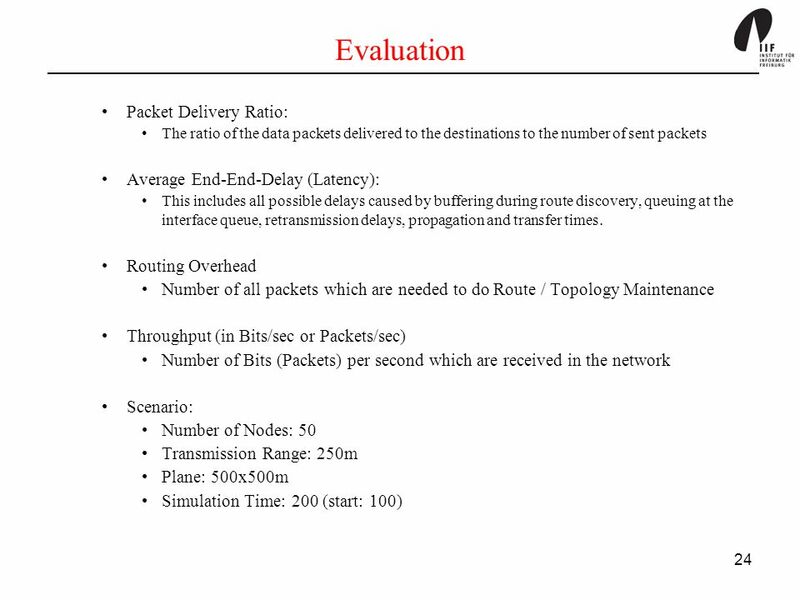 However, the packet delivery percentage is close to 100 with relatively small number of nodes. 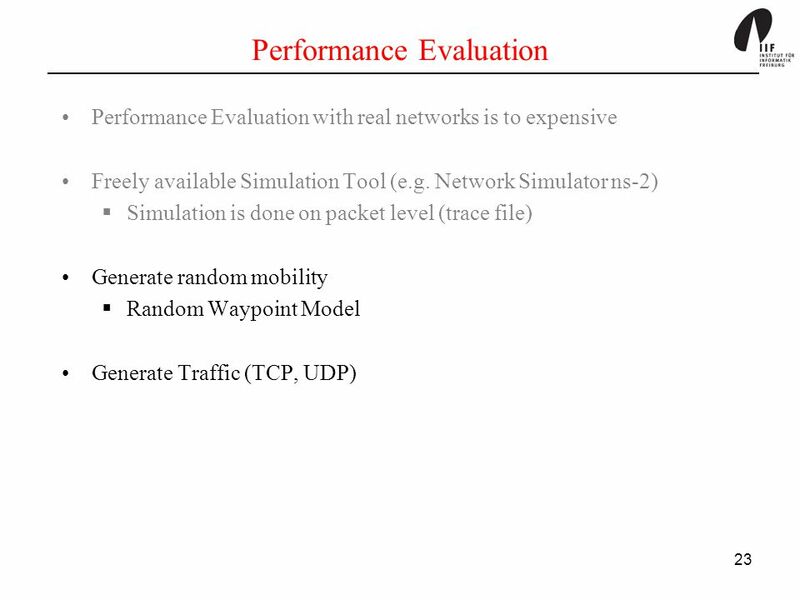 The packet delivery percentage drops with increased mobility. 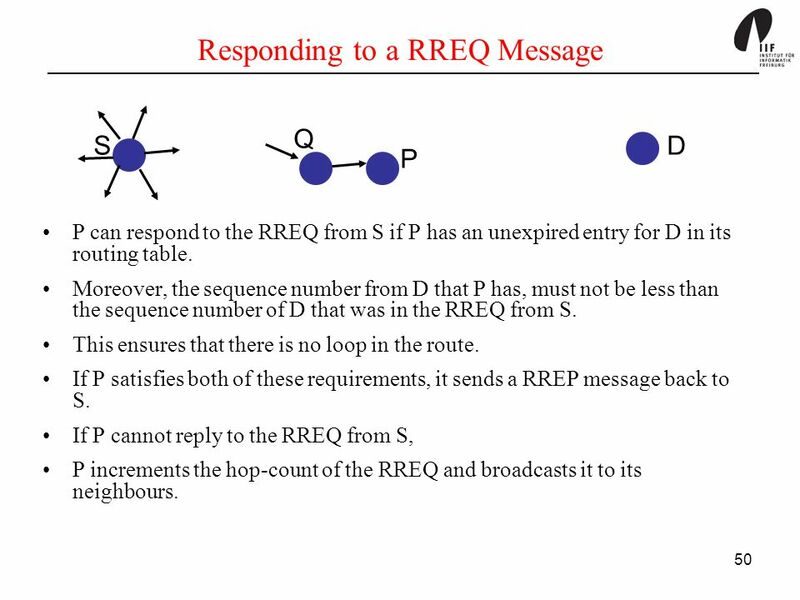 The overhead packets in AODV are due to RREQ, RREP and RERR messages. 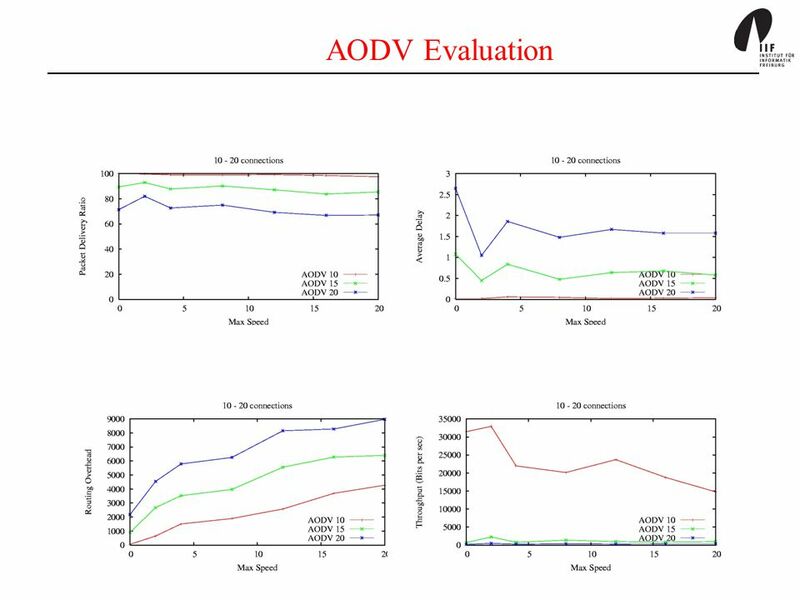 AODV needs much less number of overhead packets compared to DSDV. 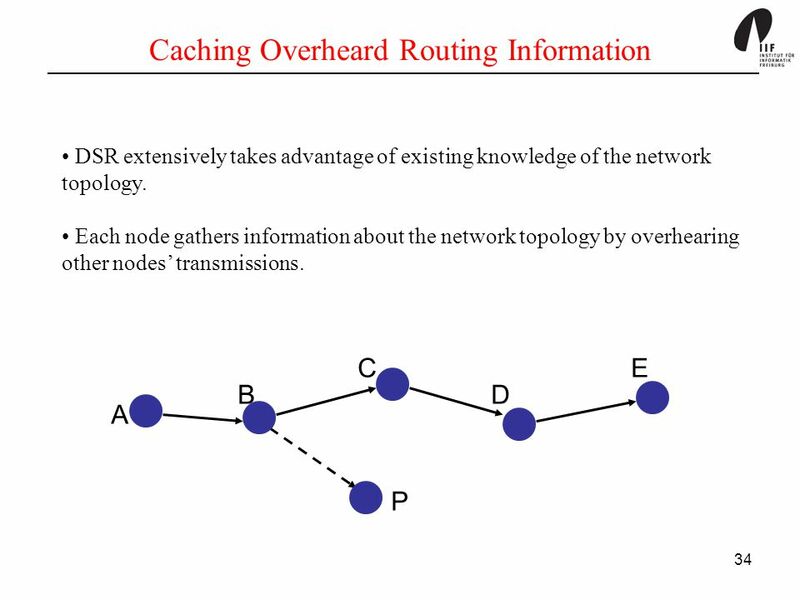 The number of overhead packets increases with increased mobility, since this gives rise to frequent link breaks and route discovery. 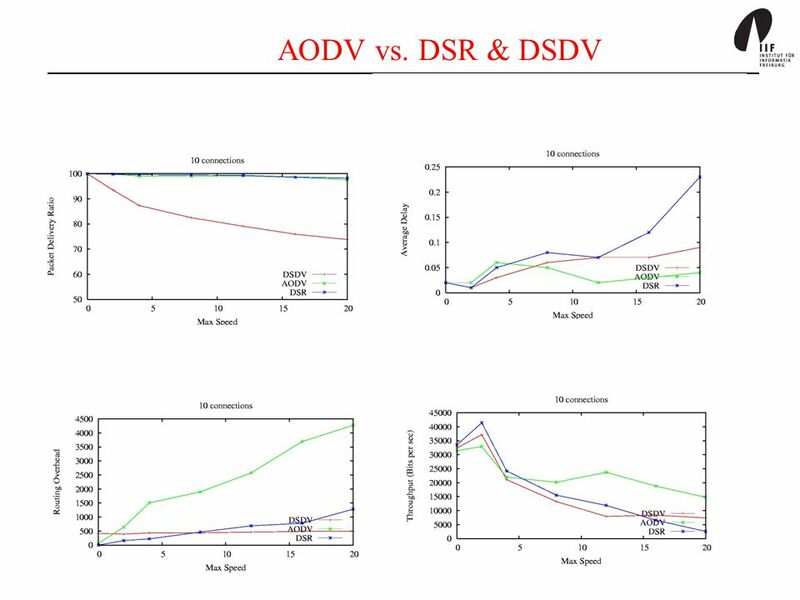 The route discovery latency in AODV is low compared to DSR and DSDV. 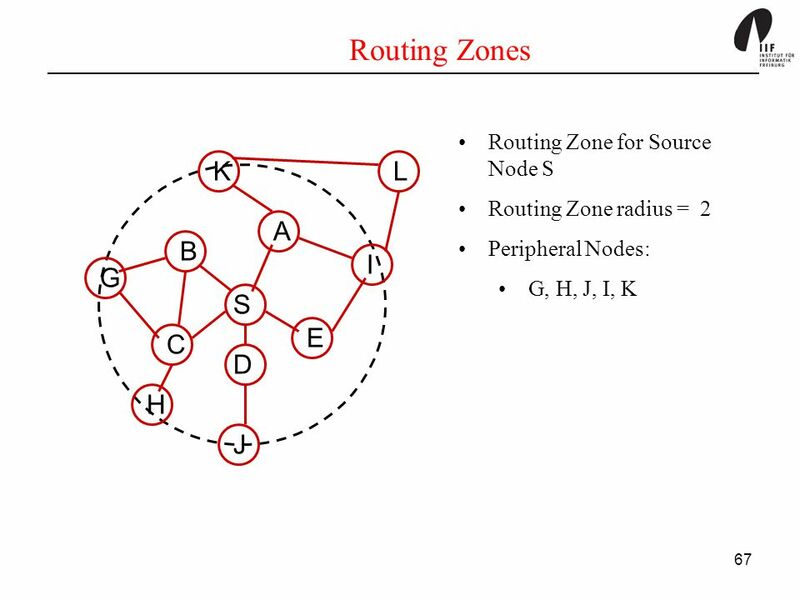 S sends a route request (RREQ) message to the peripheral nodes of its zone through bordercasting. 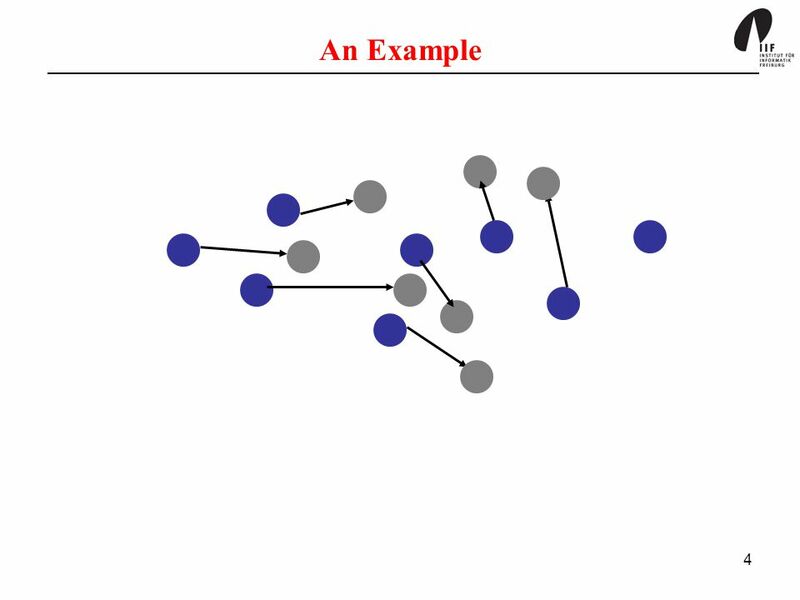 Each peripheral node P executes the same algorithm. 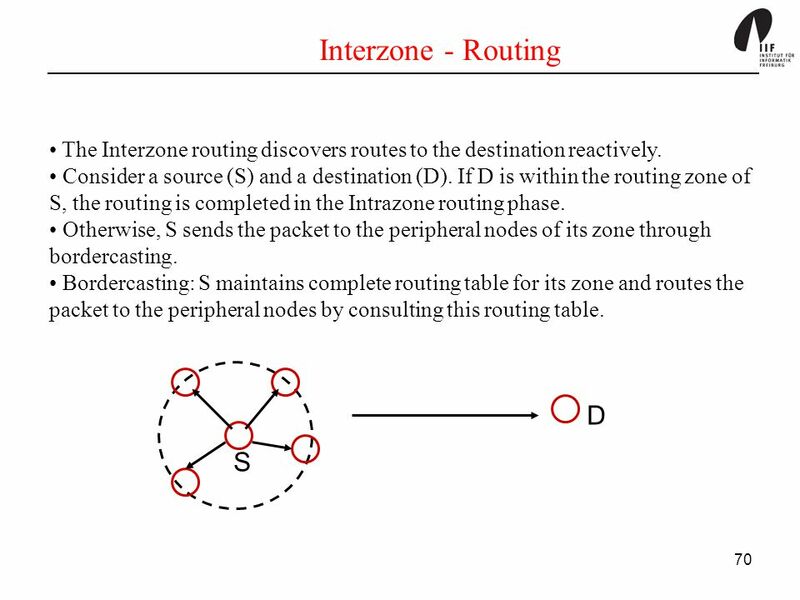 First, P checks whether the destination D is within its routing zone and if so, sends the packet to D. Otherwise, P sends the packet to the peripheral nodes of its routing zone through bordercasting. 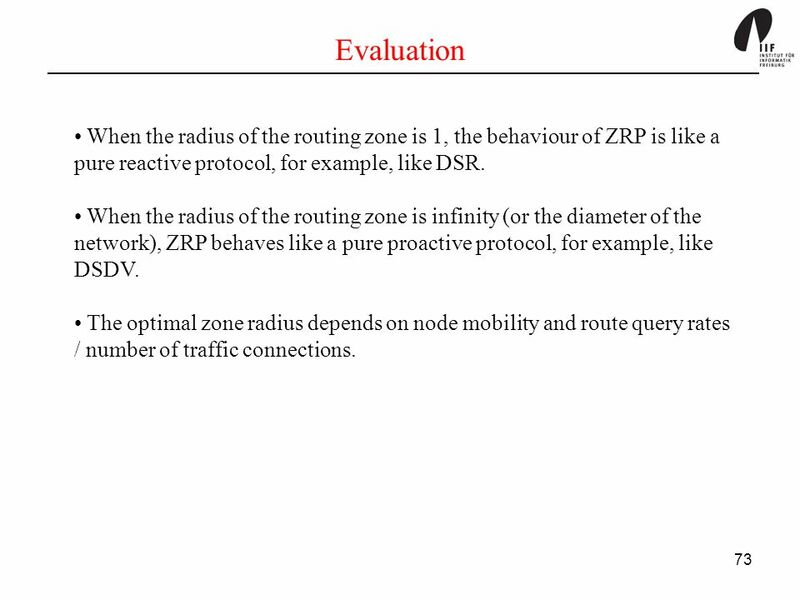 73 Evaluation When the radius of the routing zone is 1, the behaviour of ZRP is like a pure reactive protocol, for example, like DSR. 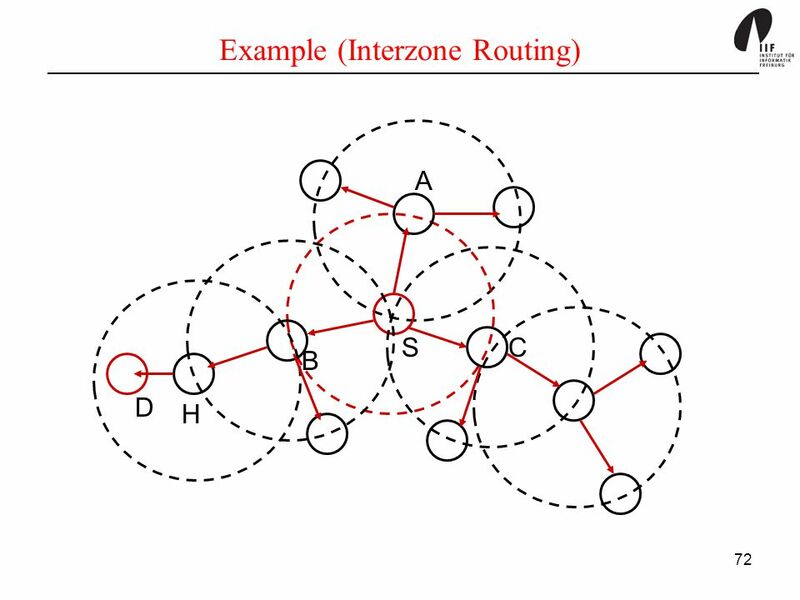 When the radius of the routing zone is infinity (or the diameter of the network), ZRP behaves like a pure proactive protocol, for example, like DSDV. 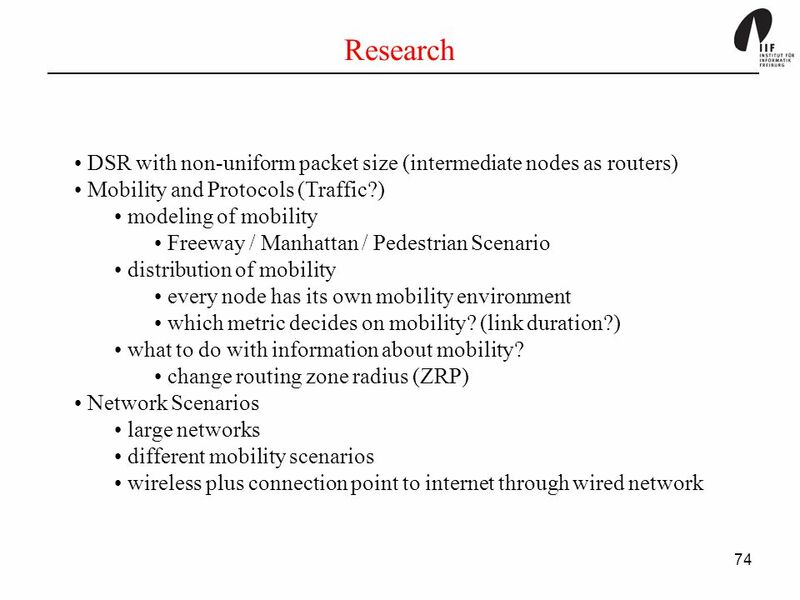 The optimal zone radius depends on node mobility and route query rates / number of traffic connections. 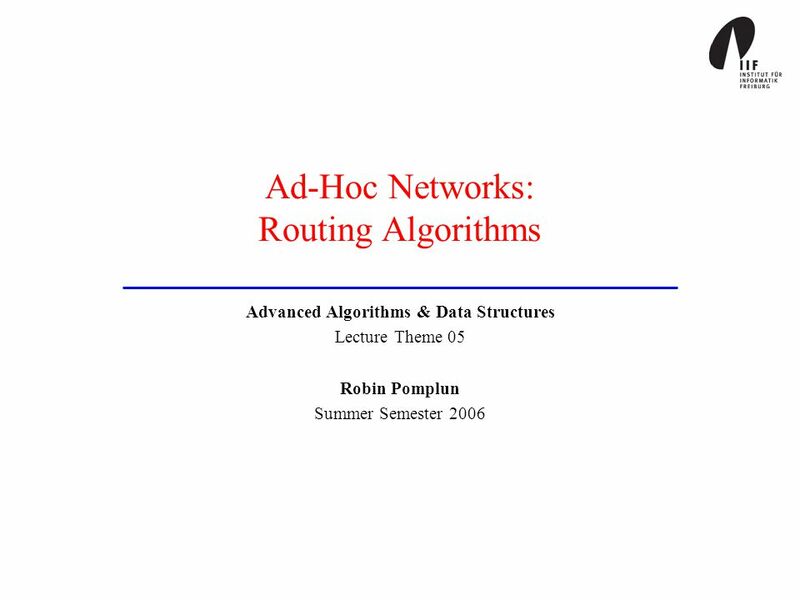 Download ppt "Ad-Hoc Networks: Routing Algorithms"
Routing Protocols Lecture # 6 Obaid Khan. 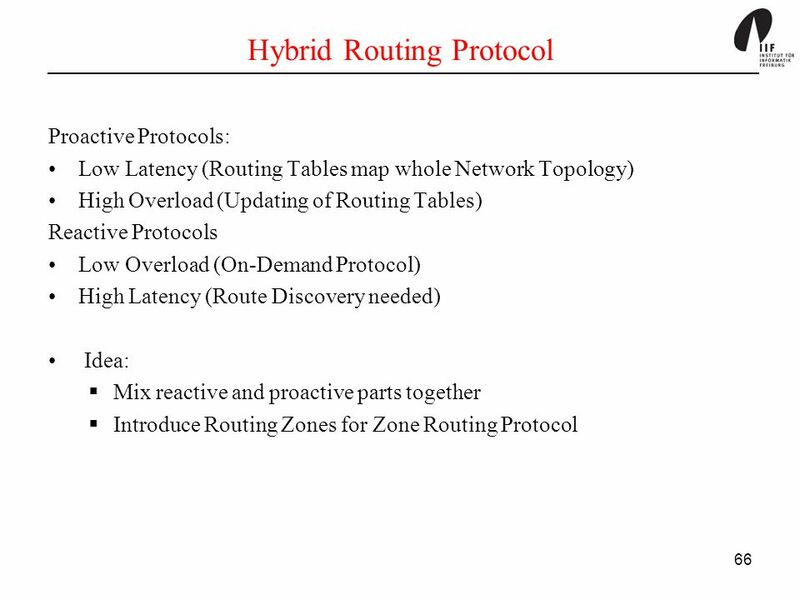 Overview of Ad Hoc Routing Protocols. Overview 1. 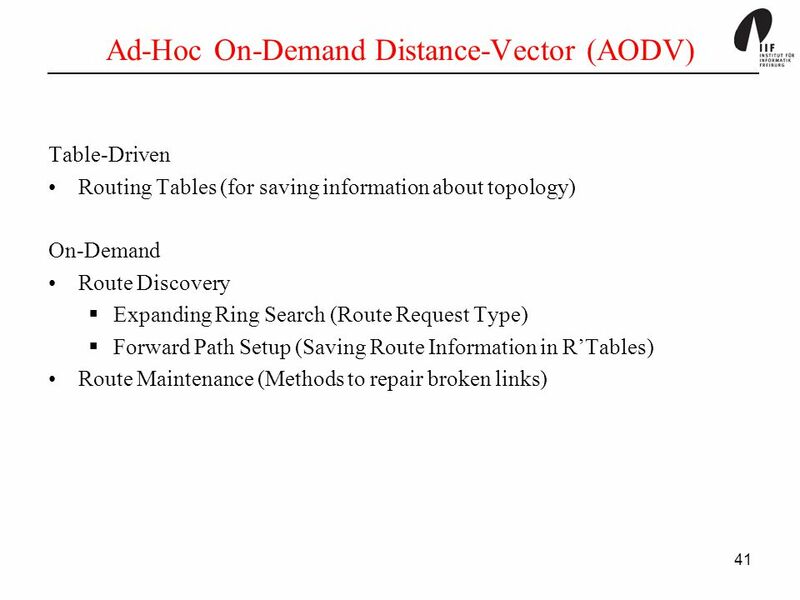 Revisiting On Demand Routing On Demand Routing schemes are reactive – a route is found when needed. This precludes the periodic exchange of routing tables. 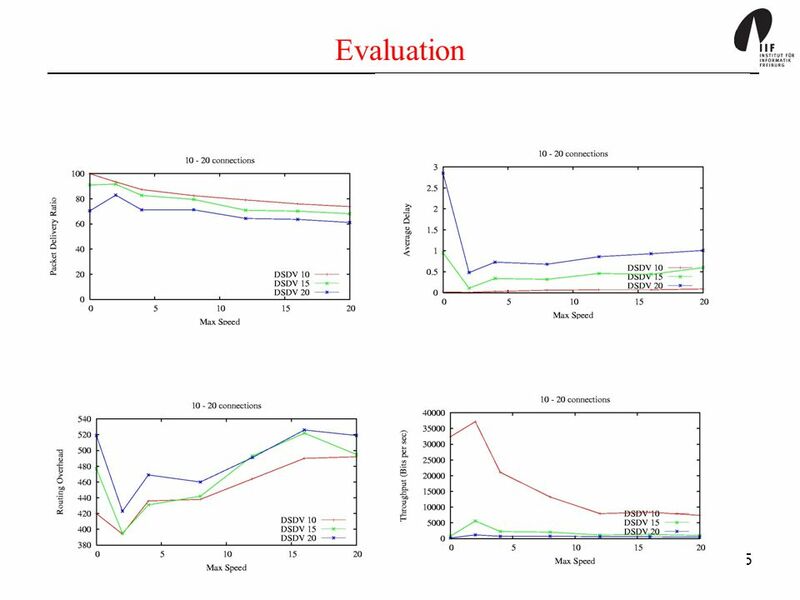 1 Routing in Mobile Ad Hoc Networks most slides taken with permission from presentation of Nitin H. Vaidya University of Illinois at Urbana-Champaign.